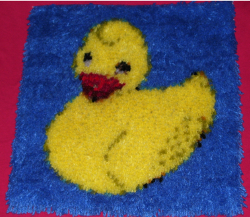 If you've completed a latch hook project using our site, we'd love to hear from you. 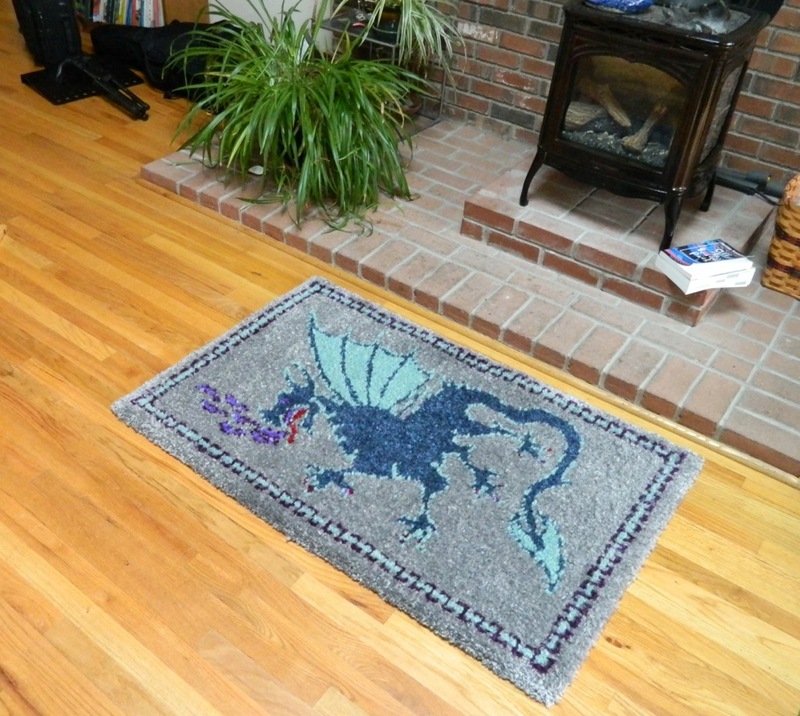 Sharing a picture of your project and allowing us to show it off would be even more delightful! Please contact us. 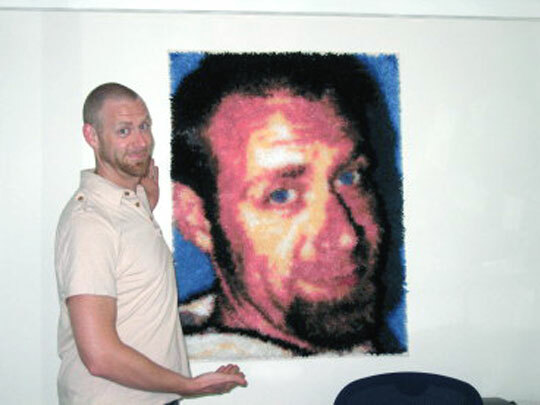 Scott Myles created his "Man-O-Lisa" self-portrait latch hook by using leftsource.com in 2008. "Featured is a picture of Dolly Parton in her famous "Best Little Whorehouse in Texas" dress. 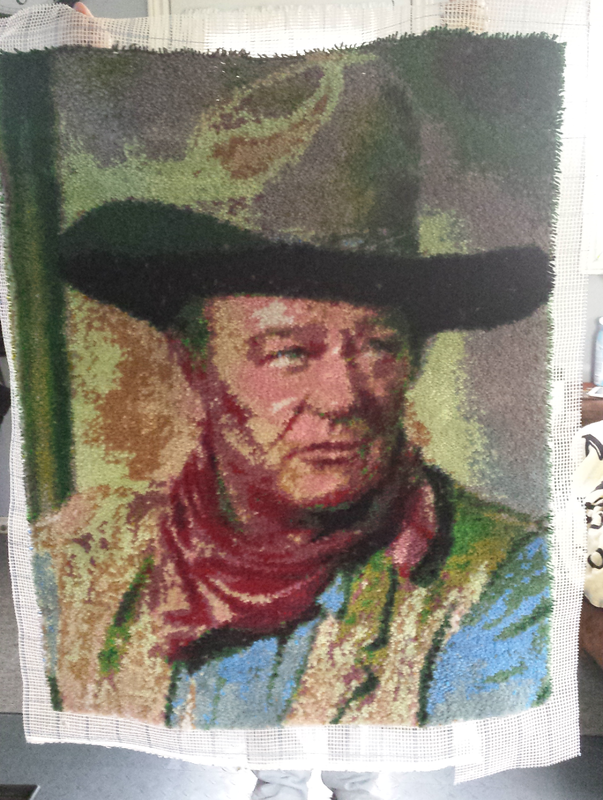 It's pretty large in size (about 36 in x 48 in) but only uses about 9 colors. 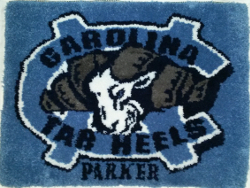 And I chose the program to only use MCG Textile colors too -- made it a whole lot easier. I had fun playing around with altering the colors -- makes the picture look sort of Andy Warhol-ish." 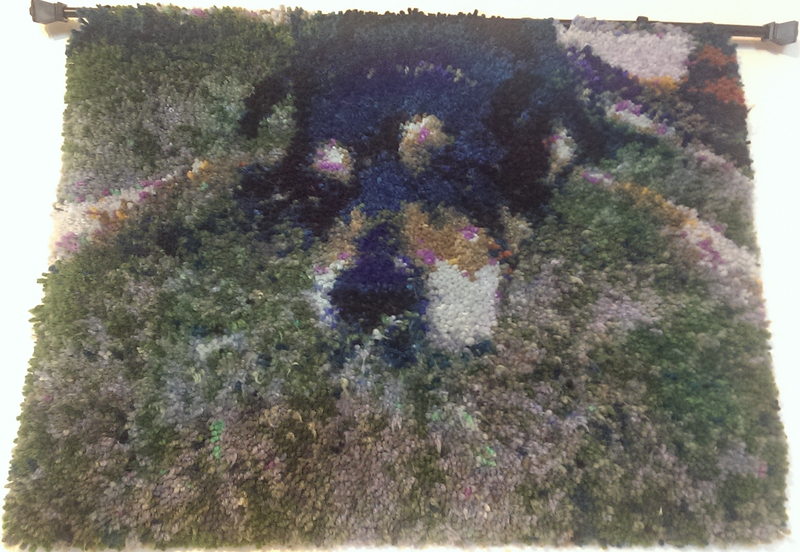 A rug of Lily on the rug. The top is the original photograph, and the bottom is a picture of the completed project. 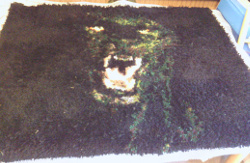 "Here is a photo of the rug I made for the Sons of Union Veterans of the Civil War. You can display it on your site, and thank you!!!" "I wanted to share with you my first finished rug using your program, although I will be hanging it on the wall, as I just can't see letting anyone walk on Jesus. 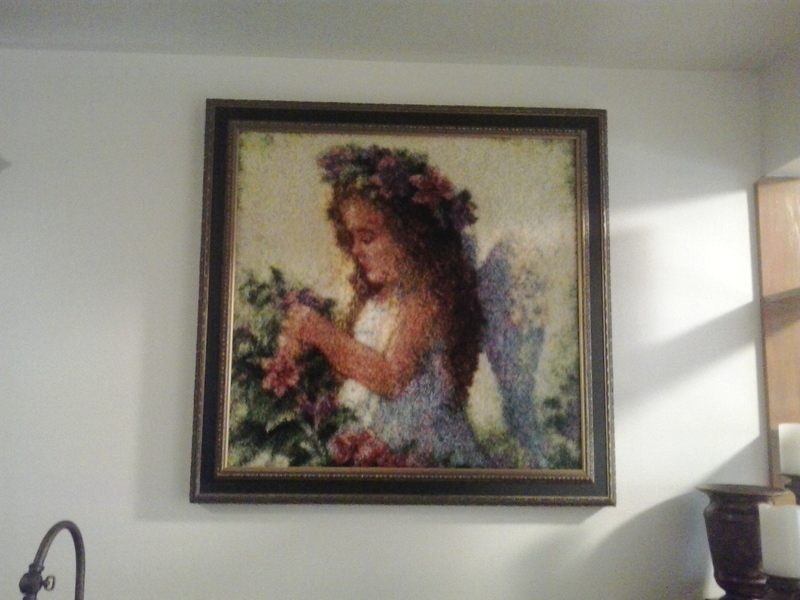 It's 18.67" x 24" using 3.75 yarns per inch. It didn't turn out as nicely as I wanted because I got all my supplies from a company with very poor quality supplies, but it didn't turn out too bad. I'm working on a much larger one now using your program. 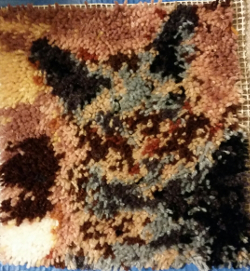 It's 5 yarns per inch canvas and it's turning out so thick that it's like carpet. 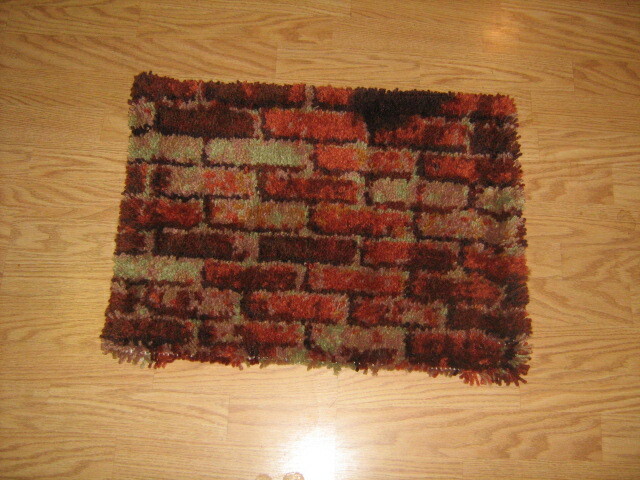 It's going to be a very nice area rug and it certainly helps having quality supplies. I've estimated it will take me around 160 hours just to latch it. As soon as I get it finished, I will send you pics. Please feel free to use my finished rug on your site as an example. Thanks again for such an awesome program. I love it!" 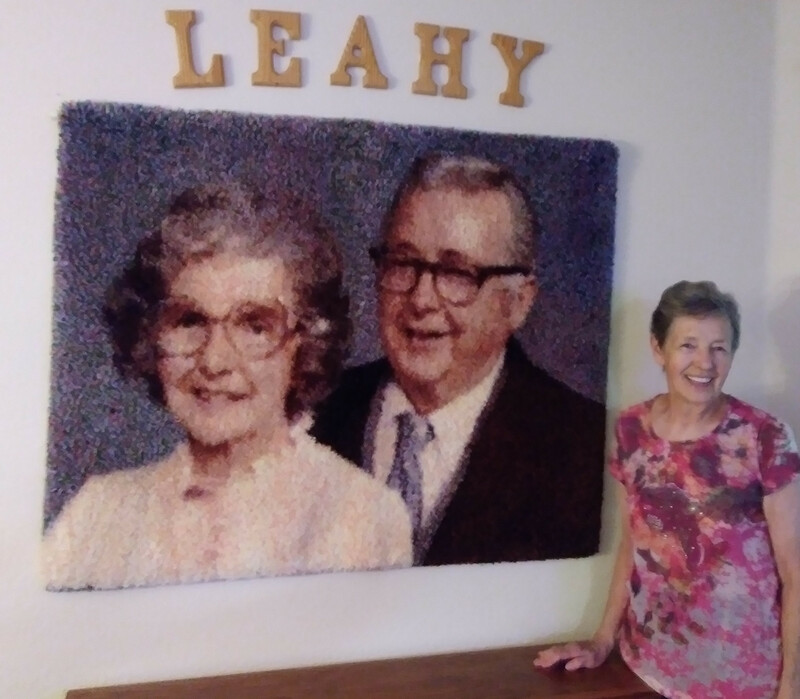 "I (pictured here with Her Honor and the latch hook project) made this wall hanging as a gift for Judge Judy. She loved it!! It was 24x19, but I didn't realize how big it actually was until Judge Judy held it up in front of her!" 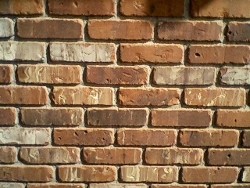 Here's a brick wall project. 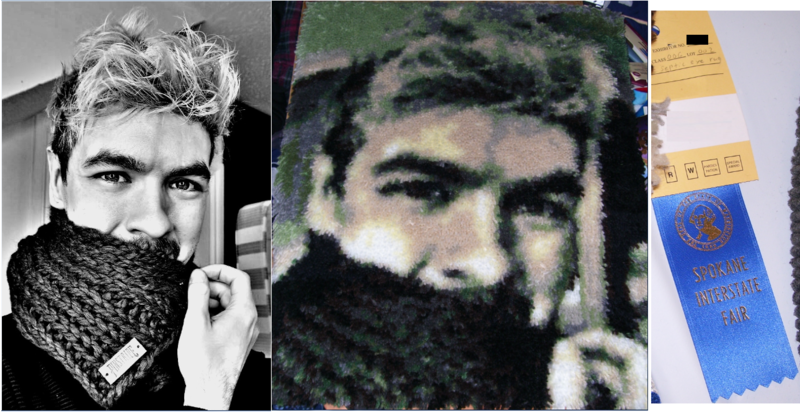 On top is the original picture, and on the bottom is a picture of the rug. 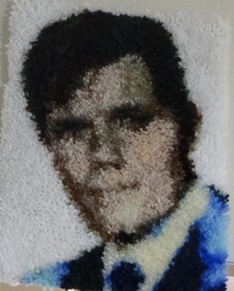 Steve McGarrett (Jack Lord) from the original Hawaii Five-O series. 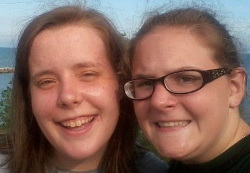 December, 2011. 21"x24" using 49 colors on 5 mesh. 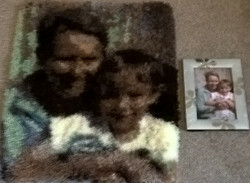 Top right is our grandson holding up his latch hook project. This project made use of the "dither" option, which helped with skin tones and shadows. Bottom right is the picture uploaded for the project. 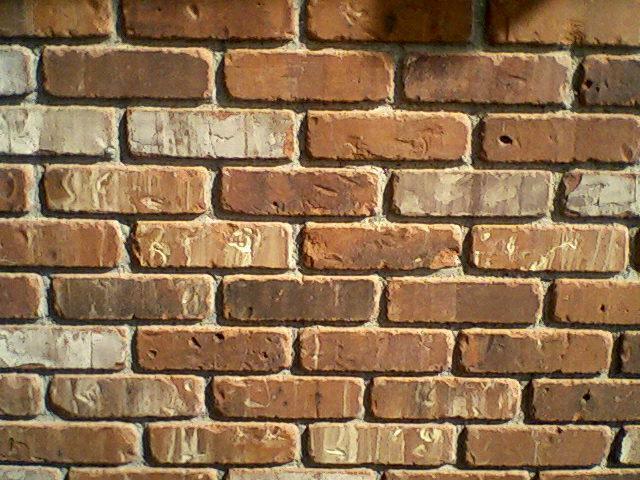 Below is a straight on view of the finished project. 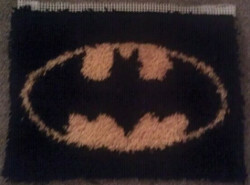 The Caped Crusader's logo. This project was submitted June 24, 2012. Paddy Cake is so cute. 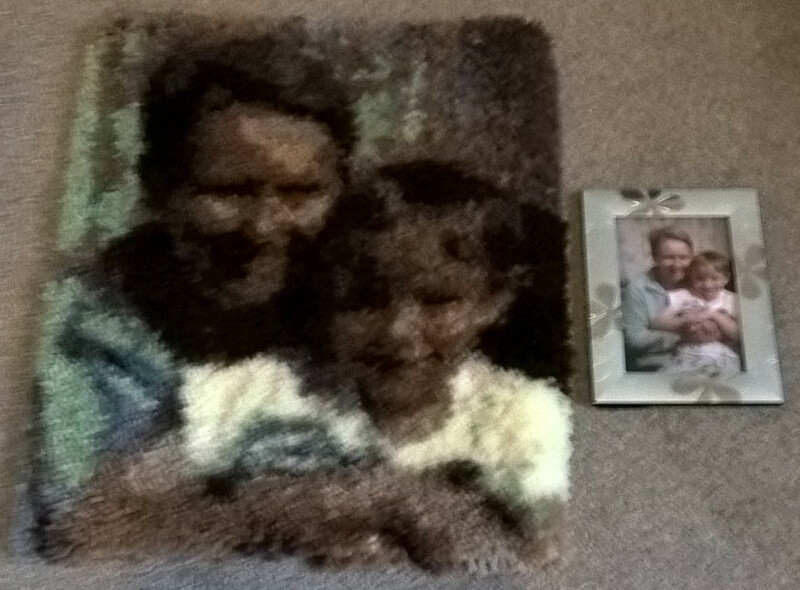 On top is the original picture, and on the bottom is a picture of the rug. 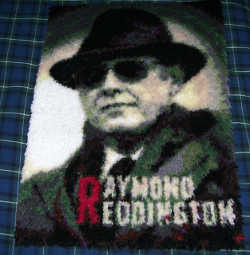 This is a wall hanging of Col. David O. Whitaker, RET. 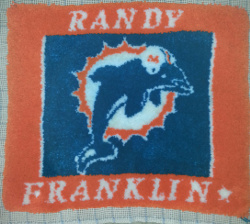 given to him as a retirement gift. .. over 25 years of dedicated service. Many years of extraordinary leadership skills, he was part of the backbone to make sure all of our troops had what they needed when they needed it. Throughout his career, he has had many responsibilities including leading a Battalion of men and women with strong support and superb organization. Spending a long time overseas in hostile situations, like many others, he encountered a few VERY CLOSE calls by a matter of seconds. He is forever grateful for his safe return as his thoughts will always remain with those who have made/continue to make the ultimate sacrifice. 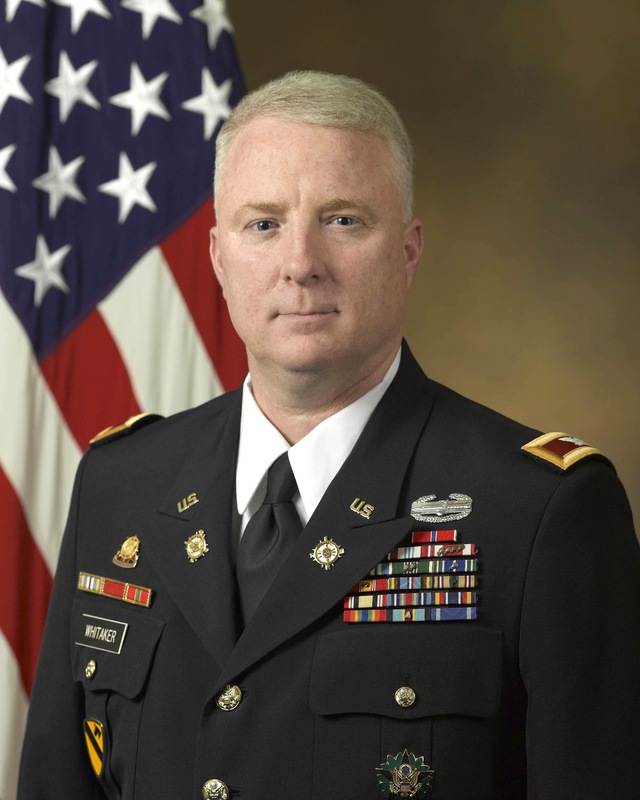 He holds degrees in the following: Master of Science, Strategic Studies, Master of Science, Business Management, Bachelor of Science in Business Management and several military schools. 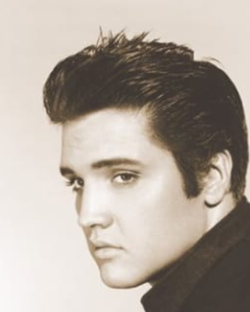 He continues to support his country and the troops but in a civilian aspect. 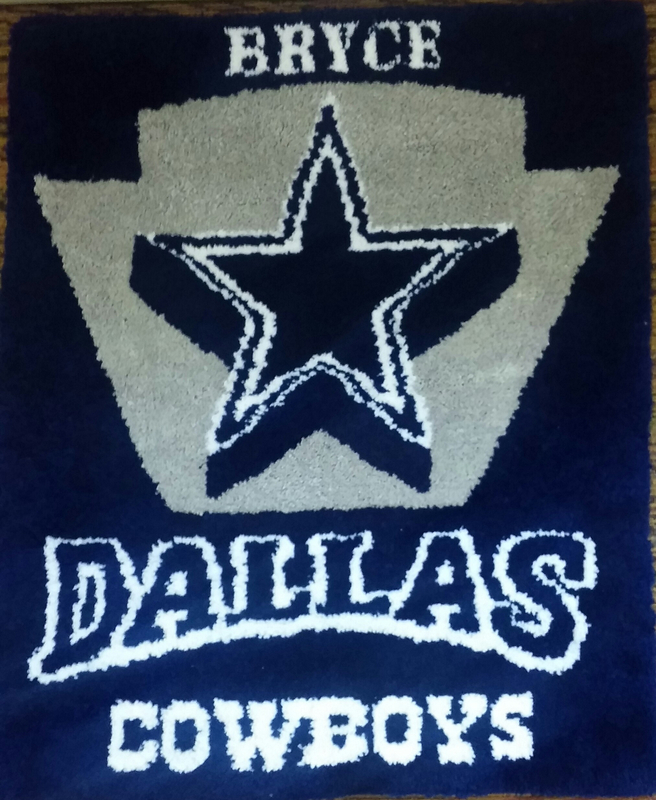 I replaced one of the colors with white being the pattern had no white in the stripes, stars, or shirt collar. Not sure what happened with the face. 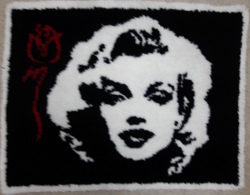 The pattern looked like it was going to be ok.
Dolly Parton again, by the same latch hook / Dolly Parton entheusiast as above. Just a head shot, but larger then the previous project - 42" x 48"! 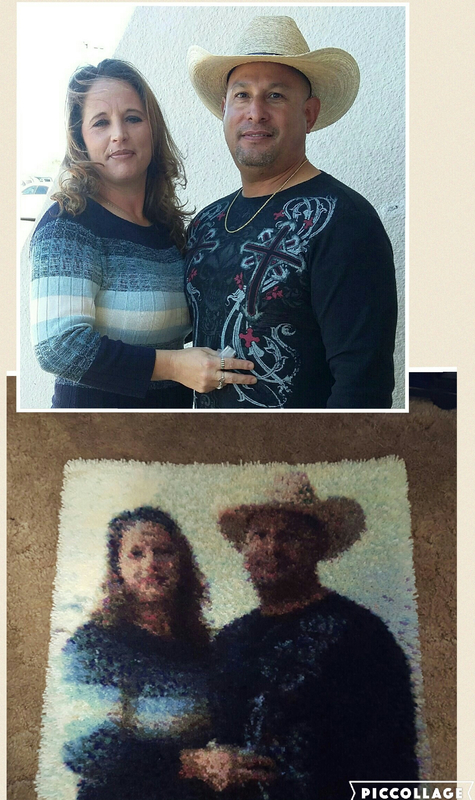 This project was created using MCG Textiles yarn for Melisa's boyfriend, John, and took about 30 hours to complete. The character is named Kratos and he's from the God of War series for playstation. 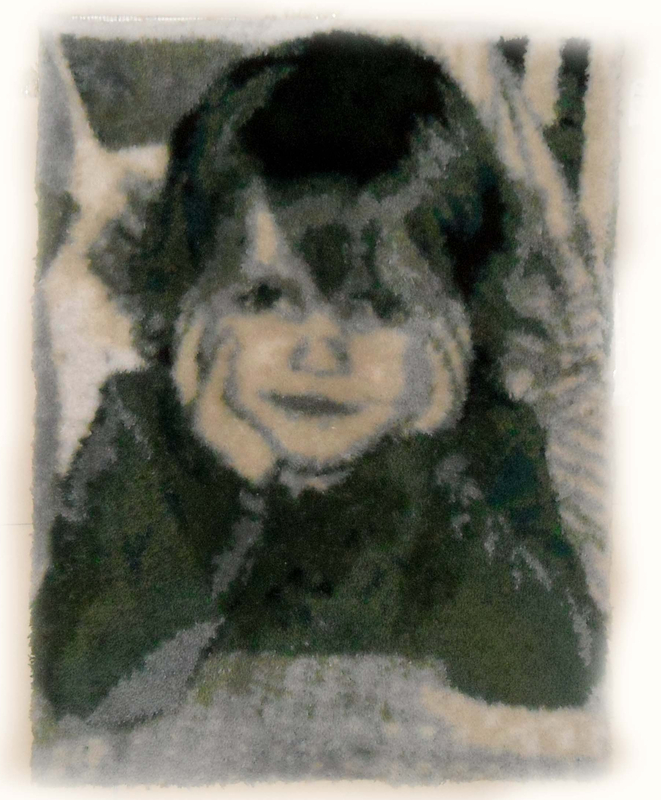 Here's a project created from a picture of Ed's grandsons. It has received many positive comments. Sage, with her name added. 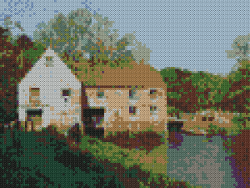 Created by Celia, this is a local (Dorset, U.K.) working water mill named Sturminster Newton Mill. Dolly Parton in 9 to 5. The picture was Photoshopped before the project was created, so the colors would be right. And yes, done by the same Dolly Parton fan as the two others above. Project dimensions: 24" x 16.6"
"My husband's favorite TV show of all time is Firefly so I made a latch hook pillow of the show's logo. I had to do a bit of finagling to make the project not use so many colors but I got it! 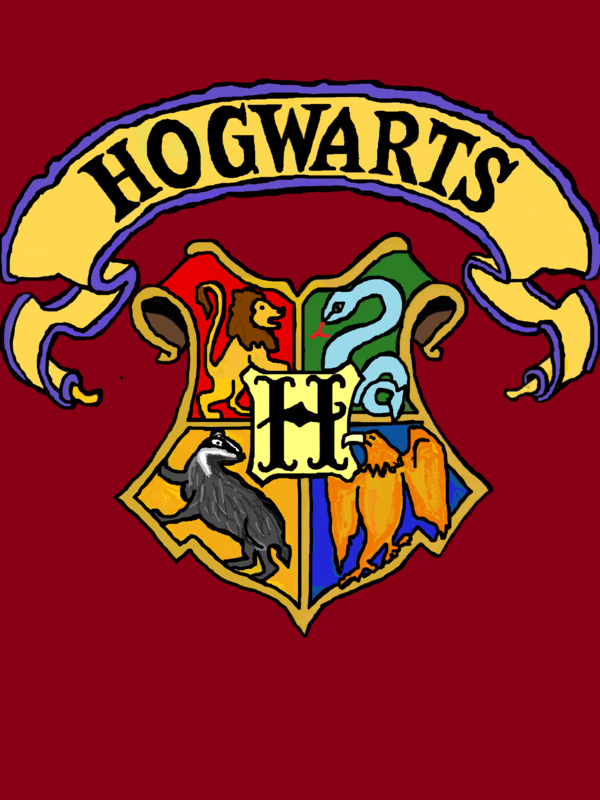 This only used four colors: two different shades of yellow, black, and rusty red. 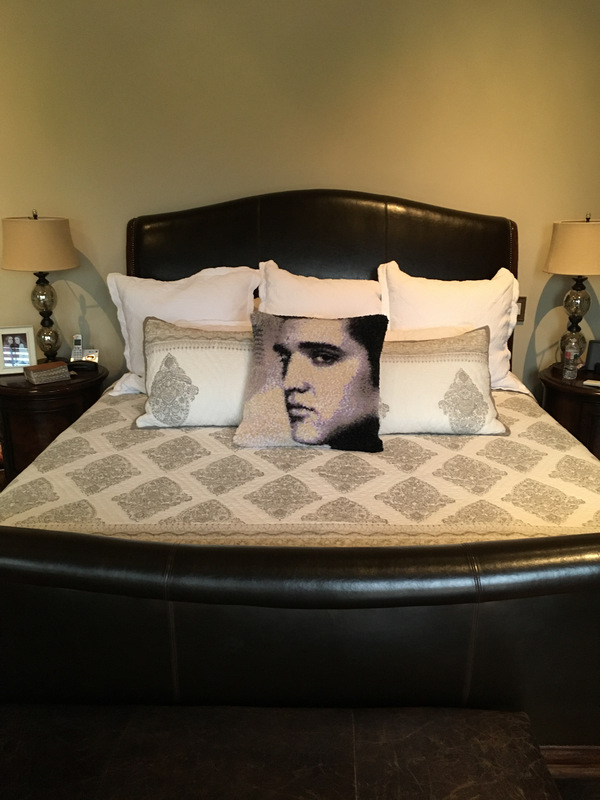 And best of all, my husband loved it!" 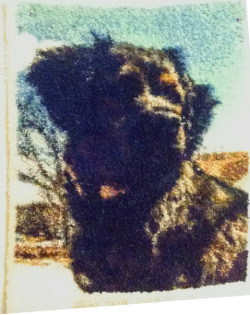 This is the first picture I did with your program of my dog cody. 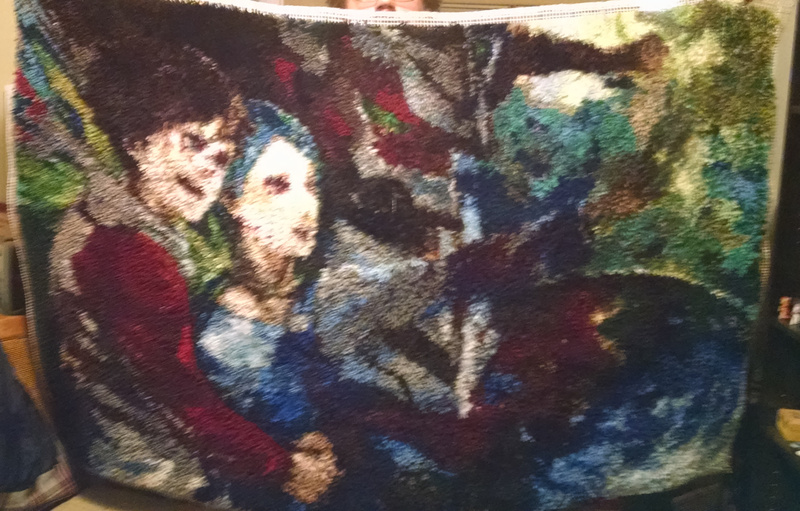 It is 47" by 50" and 24 colors, 34,200 pieces of yarn. Hand cut also. 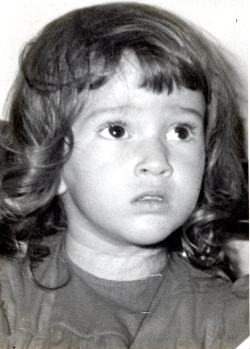 This is a picture of my wife at age 4. 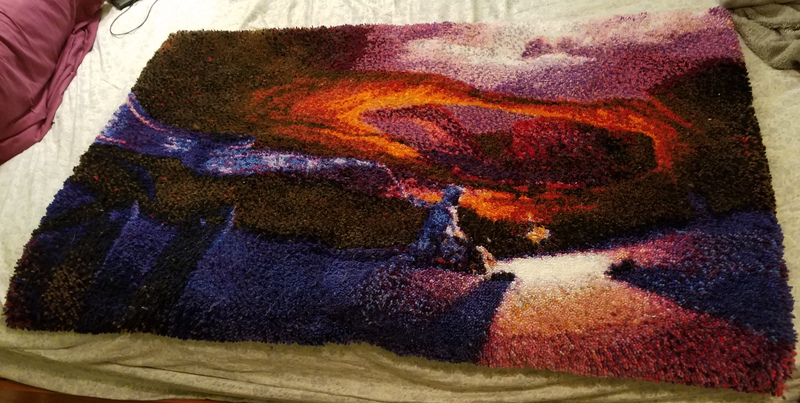 This is my 15th rug and it is my biggest one to date - 44" wide by 60" tall, 43,200 pieces of yarn, 19 colors, and I cut every piece by hand. It took 12 hours to cut it all to start. But, by doing that, I only have about $80.00 in yarn. This is my daughter annemarie at the age of 4. 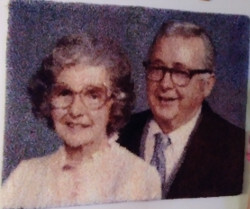 I did this one first, and my wife's next (see above) to see how they look alike. 38" by 48", 19 colors. It took 4 months. "Hi just to let you know how fantastic your website is. 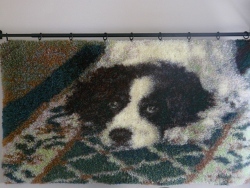 I've just finished a rug of my 3 dogs & I'm really pleased with it. 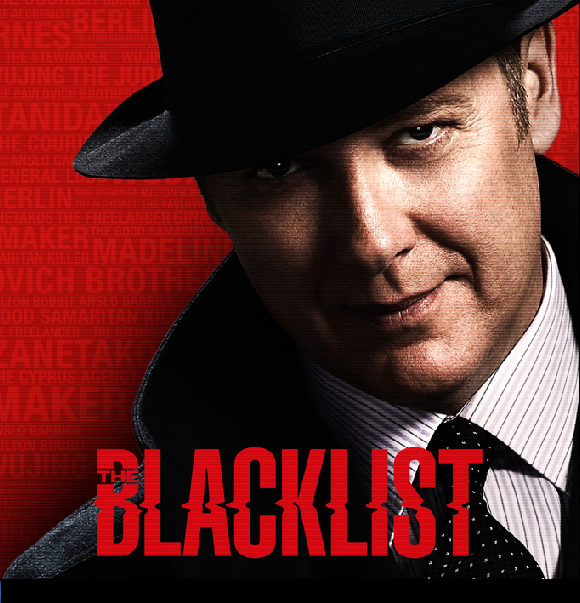 Your website is so easy to use & I've just downloaded another to start. Thank you." 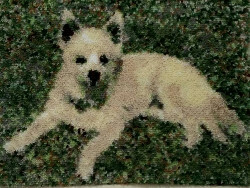 "Portrait of my late veteran Benson of 13yrs and pup Finnegan. 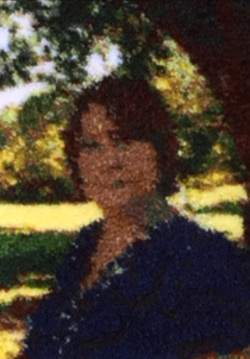 The colours in the program came out too multi and dark. 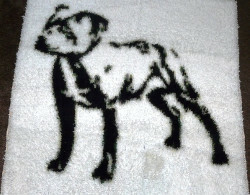 MCG textiles were so sympathetic and very helpful, to get a more accurate colour without losing definition of the silver grey Weimaraners." 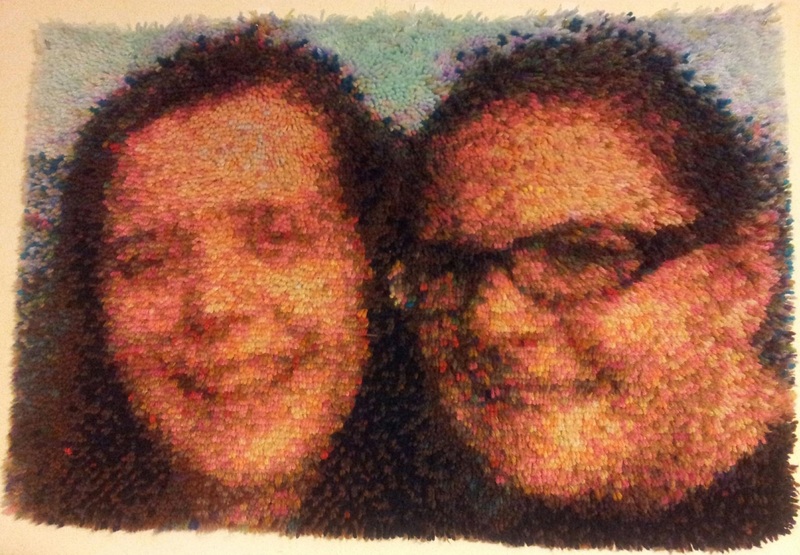 Latch Hook project portrait of my two nieces. Total project took about months to complete. Thank you so much for this website, it was so much fun to make this project. I did a lot of latch hook when I was younger but grew tired of boxed kits. 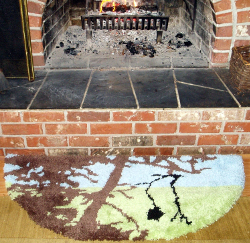 I have made a couple latch-hook rugs from your site, and have another ready to start. Thank you so much for providing this tool. Here are two - the first I only used 9 colors and it turned out well. The second turned out better than expected. I like to pick my own images and not have to get a kit. I hardly ever found one i liked. This rug was completed on 5 mesh canvas using MCG Textiles. I highly recommend their products! 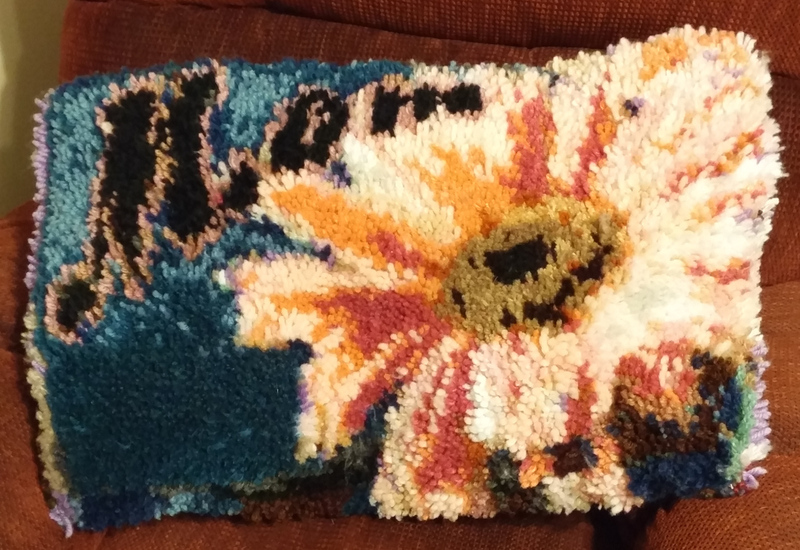 I was very happy that the yarn was more durable and did not fray as bad. 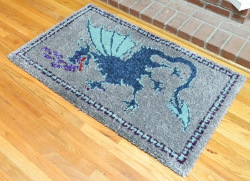 I used iron on rug binding to finish it off. This is a 24" x 34" that will be framed according to the gentleman who had asked me to do this. 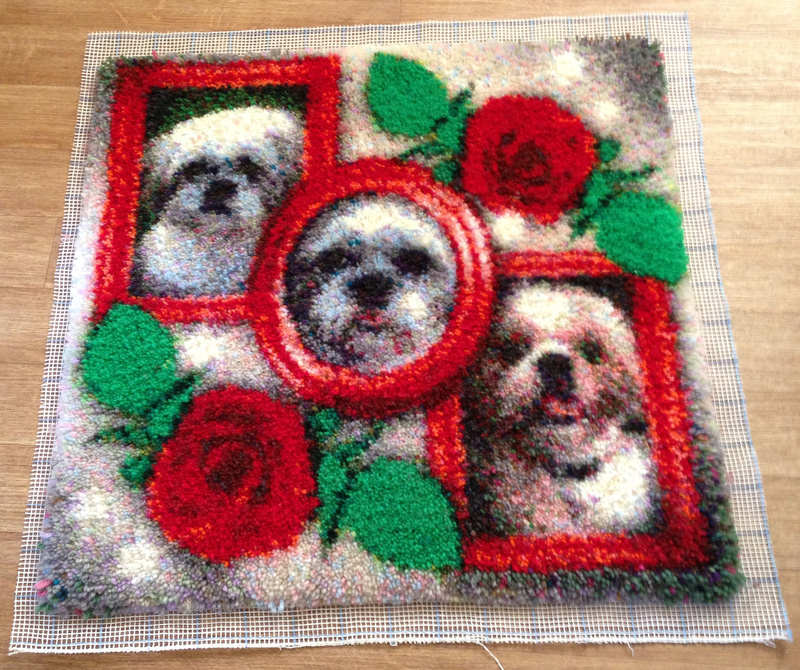 I left a 1" canvas border around the working for him to have it framed. The emblem and its wording placement was per his specifications. Although it may be difficult to see here, but it is for the VFW Ladies Auxiliary. In this photo, the colors are a bit dark. In actuality, they are lighter. I was very pleased with the outcome! 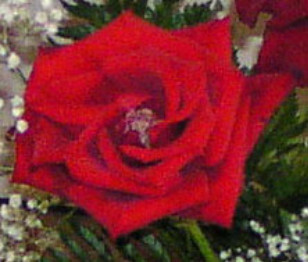 One Red Rose. Created using 3.75 canvas and Joann Fabric yarn. 12" x 10", and 8 colors. "The rose is from a bouquet I gave my wife. We were both quite pleased with the results!" 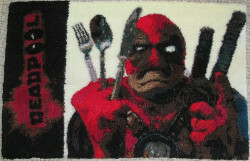 Image of the Marvel Comics character, Deadpool, with a full 36"x60" 5-mesh canvas. 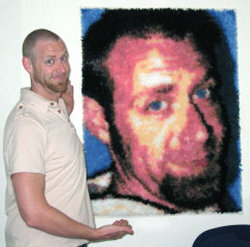 I've been doing latch hook rug since I was 13, now 47. 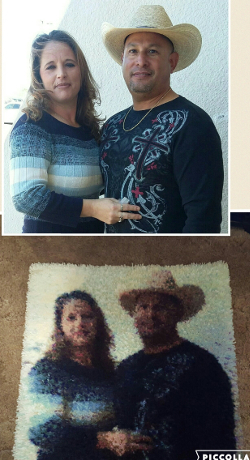 My friend wanted me to do a heart rug for her, but I didn't want it to be a simple rug so I found a sunset to put in the back ground, and then the couple looked nice. I only used the silhouette from the lower pic. 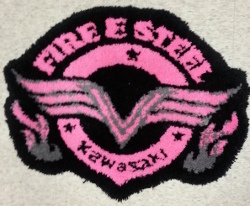 Kawasaki Fire and Steel (female version). 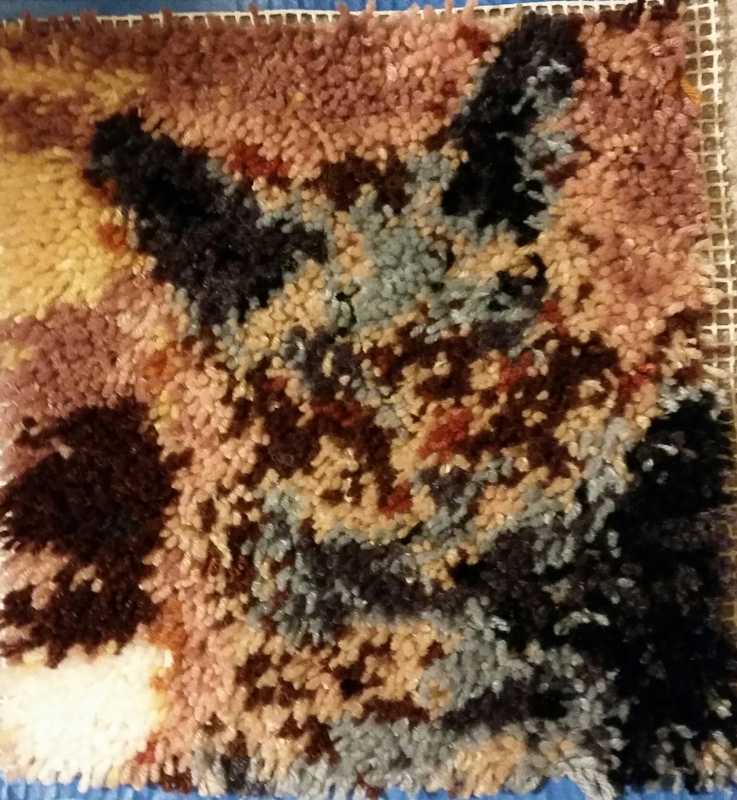 (Apparently) only two colors, but it turned out great! 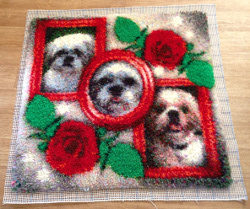 "Hi Guys, Just thought I would send you a picture of my latest finished project. It is a picture of my daughter and is a graduation present for her. Took 7 months to complete. I am absolutely rapt with it, and would like to take this opportunity to thank you so very much for allowing us to use your website in order to do this unique type of work. So very much appreciated." 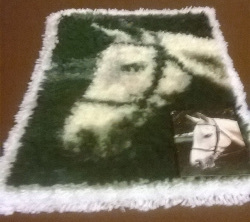 "I created this colt 45 latch hook rug back in July 2014. 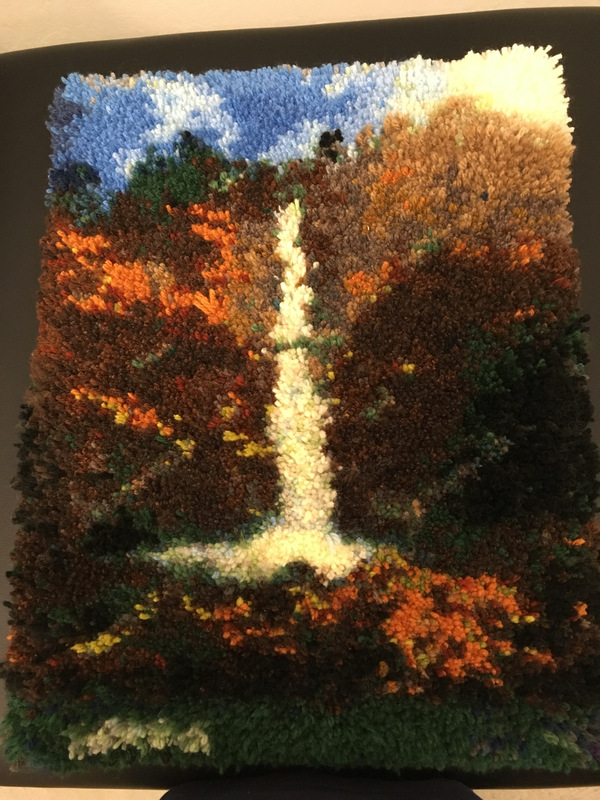 It is 21" by 60" and uses 54 different colors. 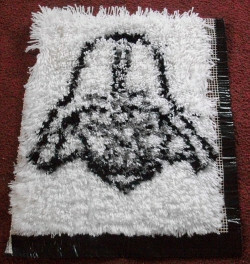 I'm impressed with how well it turned out, but I am still trying to figure out exactly what to do with it." 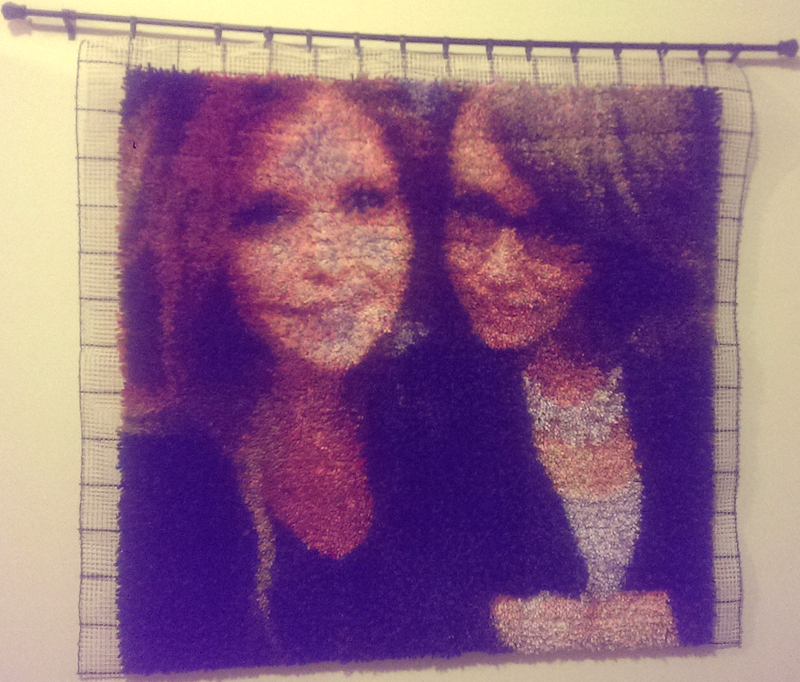 "This is a gift I made for my sister who does so much for me. 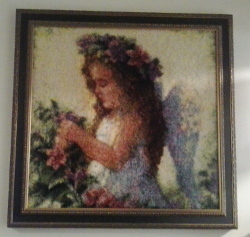 This Angel has 88 colors.....is 28,730 knots......and is 34' X 34' without the frame. It took me 5 months to complete it with a lot of time off periodically. 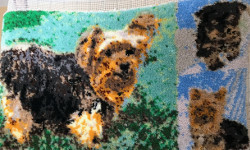 It started with a tiny picture that your site helped me to turn to pattern. Thank you!!" 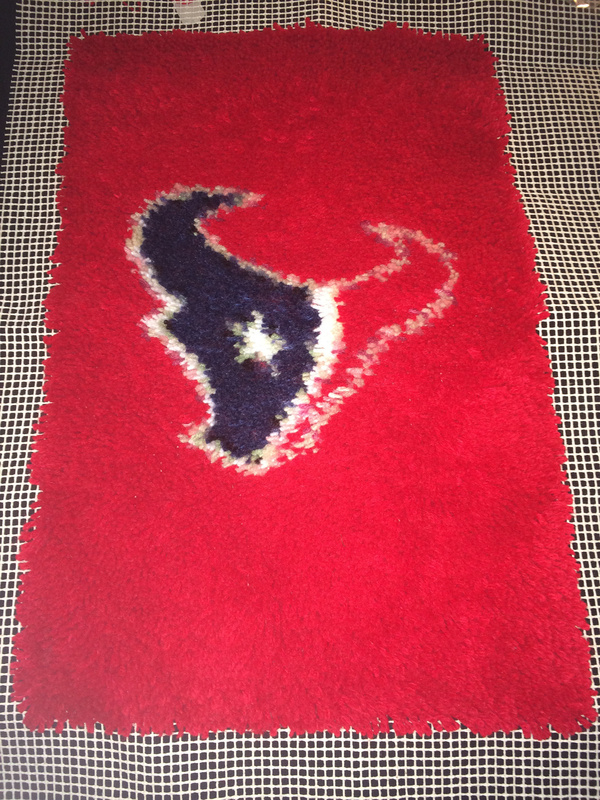 The Houston Texans logo, with a red background. "Just thought I would share my project with you all. 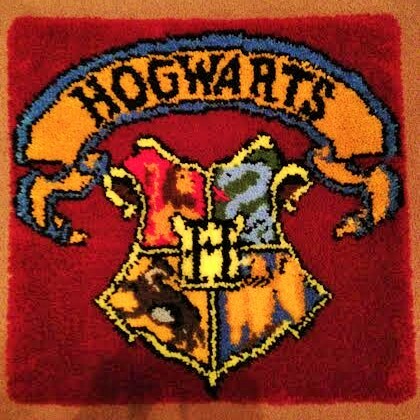 It took me 9 months to do it, but I have finally completed my Latch Hook. The size is 175 x 90, not counting going around the door. Thank you leftsource, because without this program, I would not have been able to do this. Your program is amazing." "Hello again. 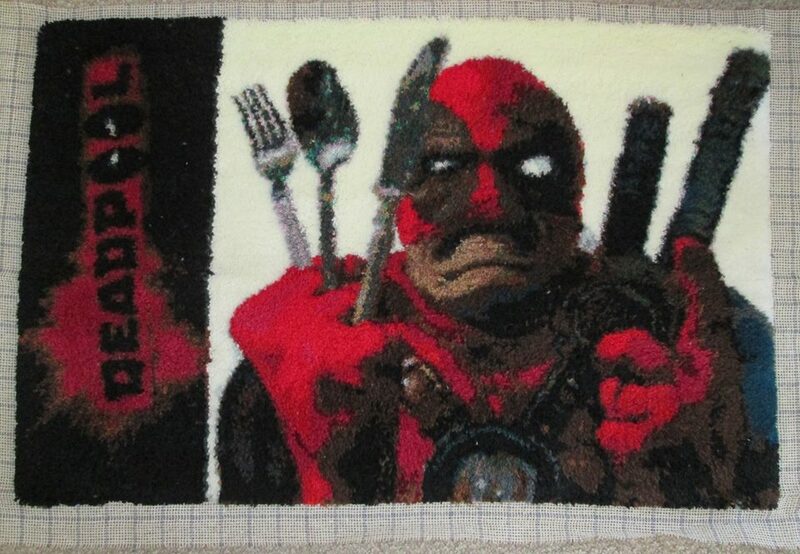 My name is Cameron and I submitted a photo of the Deadpool latch hook. I have another one. 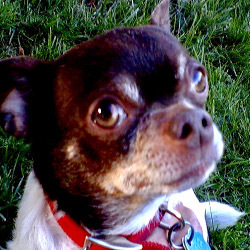 This is Uzie. 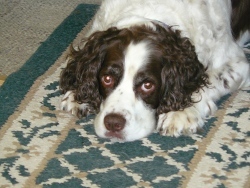 She was the dog of a very close friend of mine. Uzie had to leave us in May 2013. 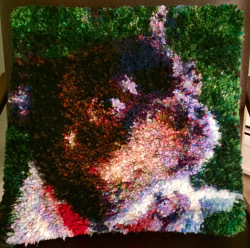 This latch hook portrait of her was done as a loving tribute to her memory. 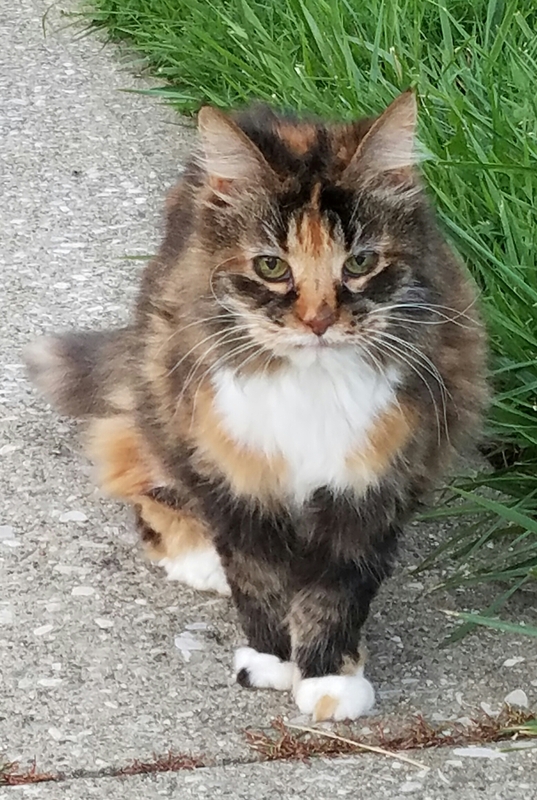 I don't know why the pattern made her brown fur purple." "Thank you so much for making this possible. My sister's horse who was a family favourite. I think it turned out quite well." 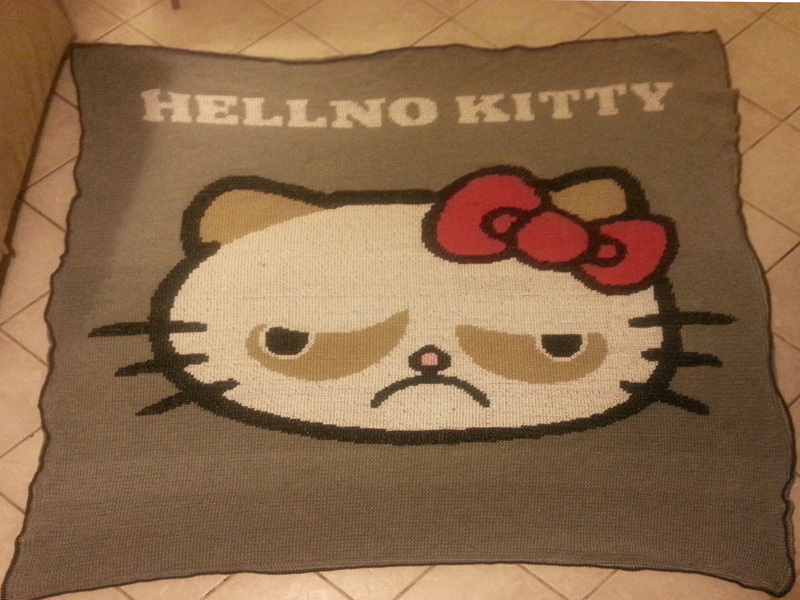 "Modified the template and personalized. Thanks a million." "Thank you for providing this service. 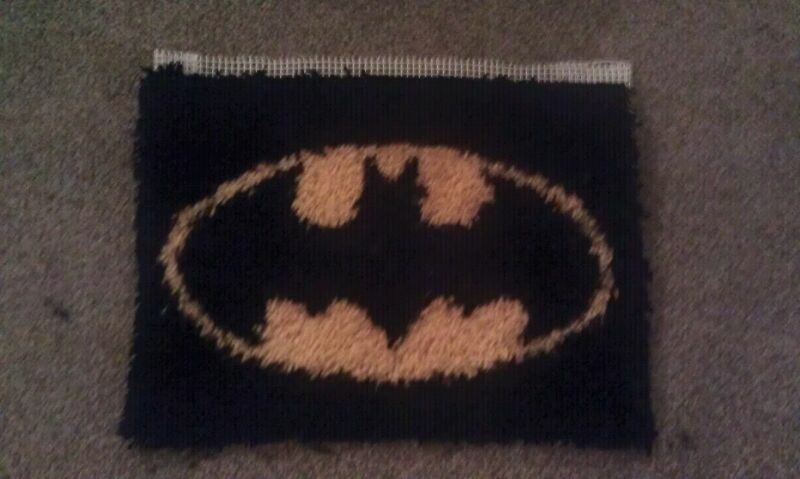 I'm attaching a picture of a rug I completed for my grandson using leftsource." 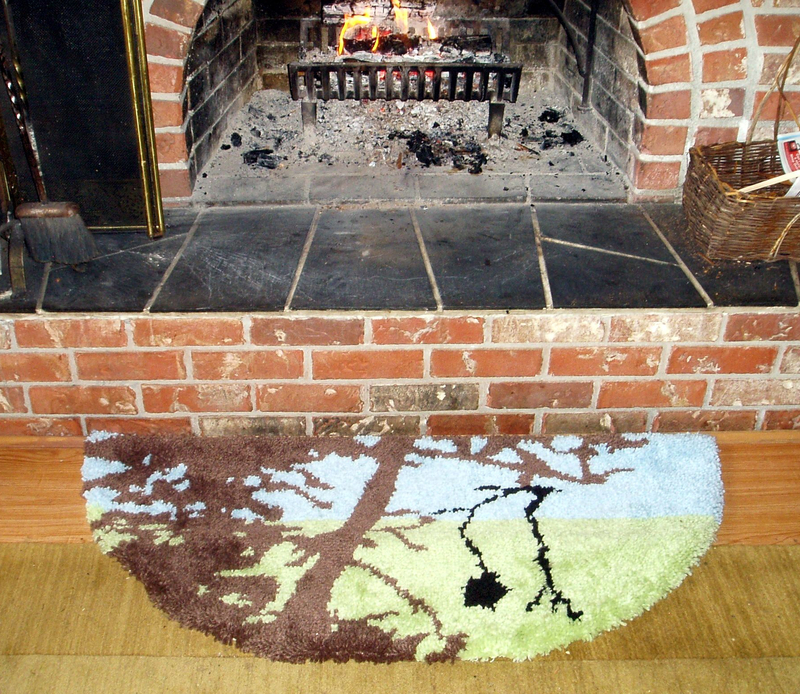 "Here's my rug that your site helped me make." 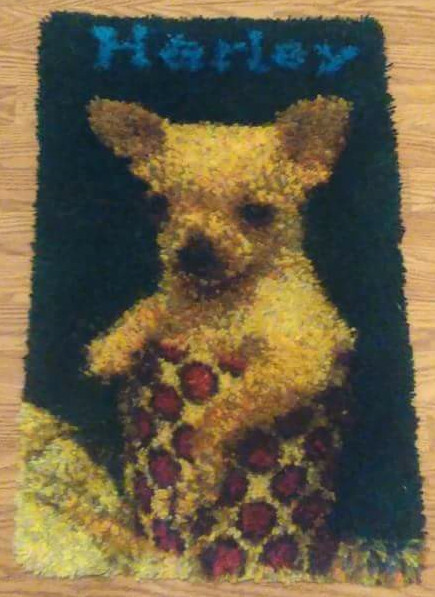 "This Rug that I made from this website won first prize at the nearby interstate fair." "One of my many projects." 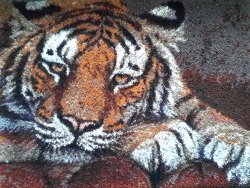 "This rug is taken from a picture from my friend. 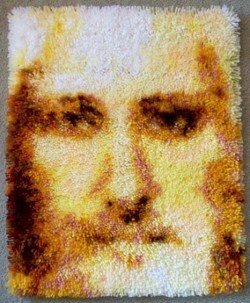 I used Mary Maxim wool canvas 3.75 holes per inch. It wasn't a clear picture but she wanted this picture of her dog who died and her two boys. They already want me to make another one." "Hello!! I just wanted to say thank you!! 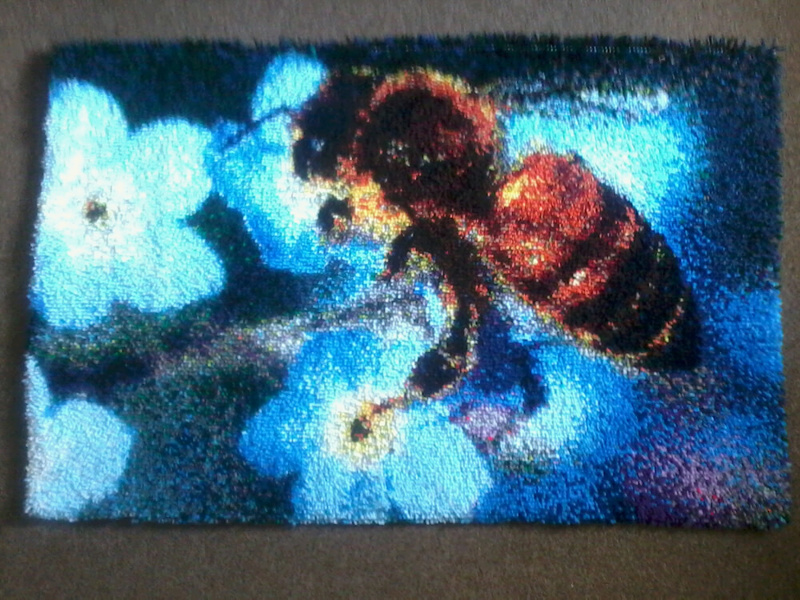 I just finished making a latch hook rug with the help of your lovely website. I'm so glad this site exists. 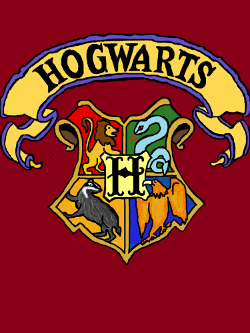 I had so much fun making it." 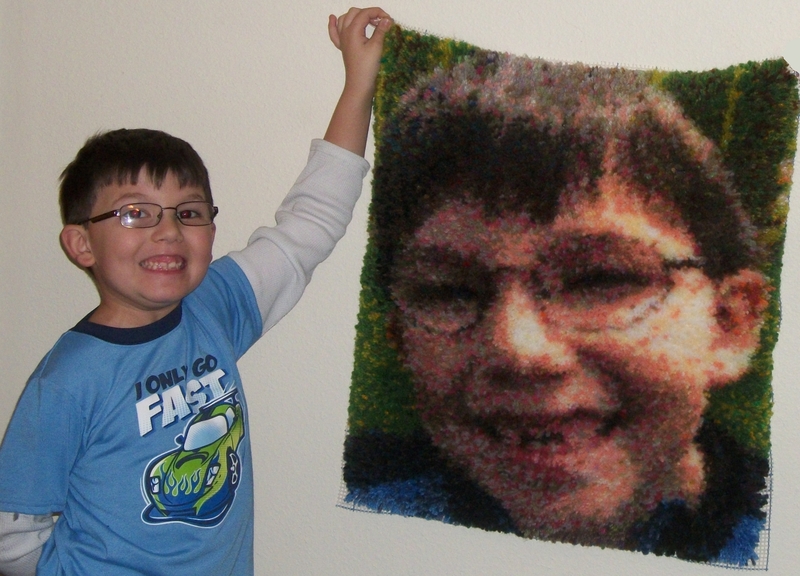 "My cousin loves Charlie Brown and Snoopy, so with the help of your website, I made this wall hanging for him." 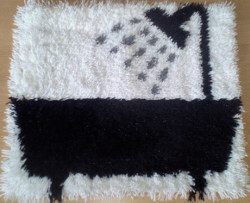 "Here's another rug I made with the help of your website. "Here's another rug I made for one of my cousins with the help of your website. Thank you. "This is my latch hook project I made for a friend. 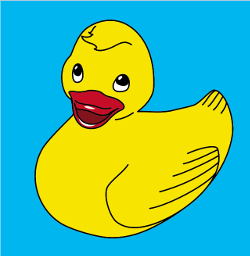 I uploaded the picture to your website and you designed the rest. 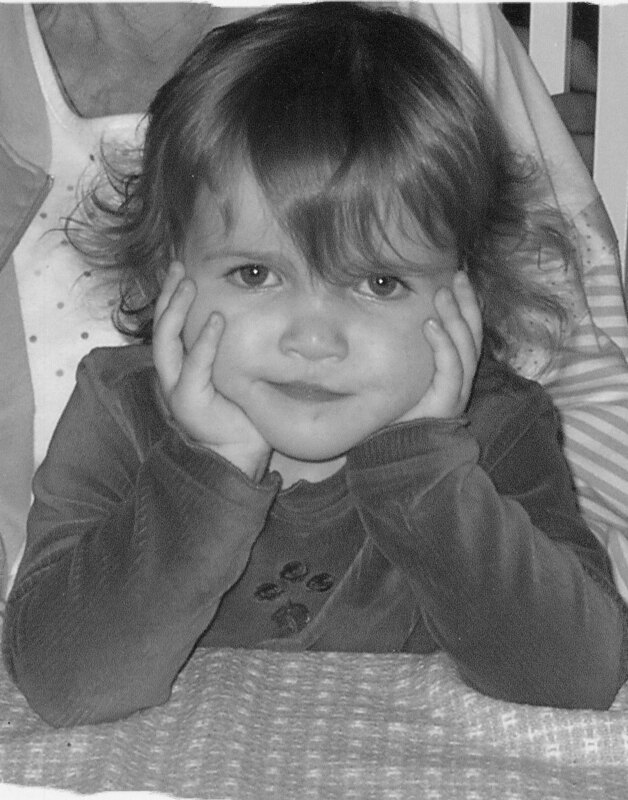 It's her sister that died suddenly. She loved it and said she would treasure it from now on. Thank you so much I love your website." 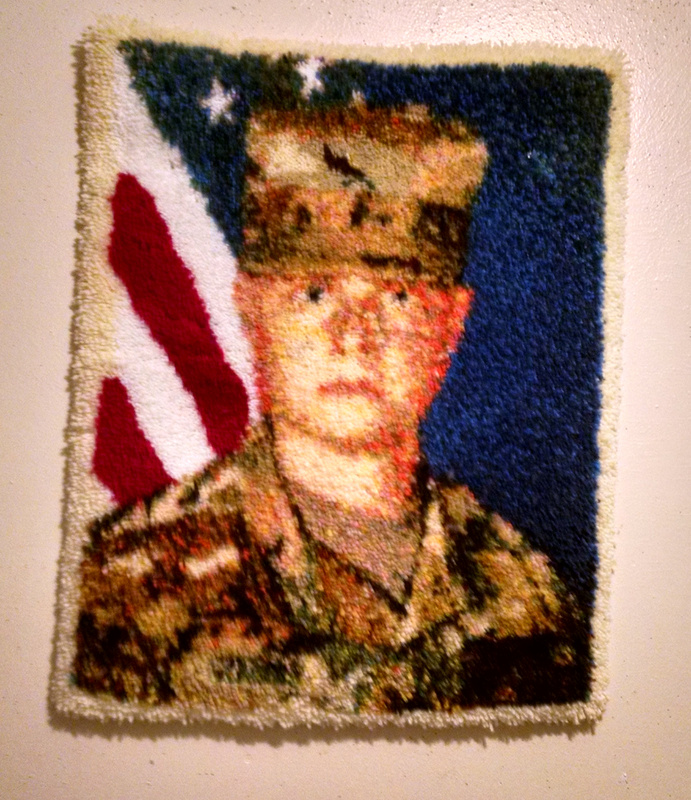 "I'm working on a project now of my grandson and it is turning out beautiful. I will send a picture of it when I'm finished completing it." 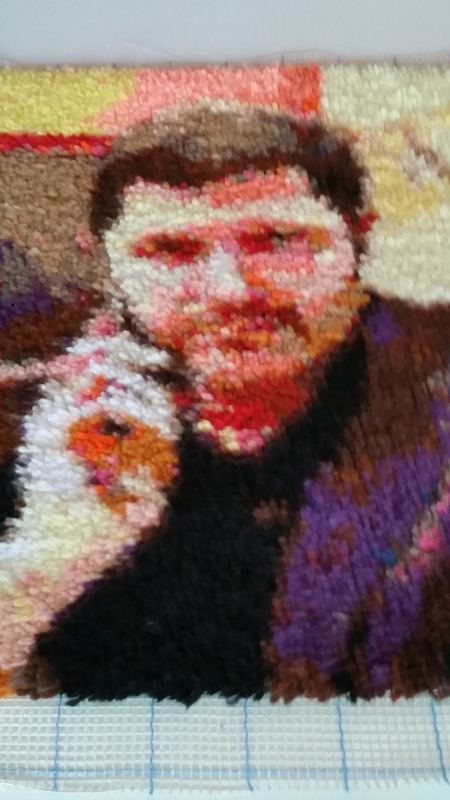 "Here's another rug your website helped me make." 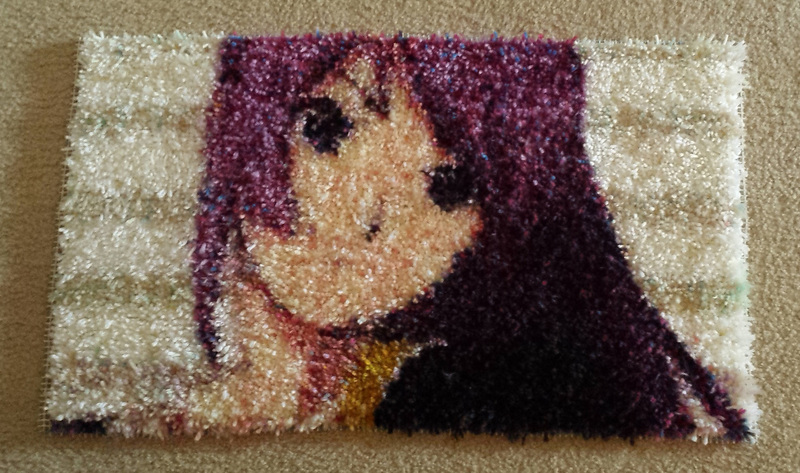 "I used Leftsource to make my brother a Christmas present based on his favorite anime character. 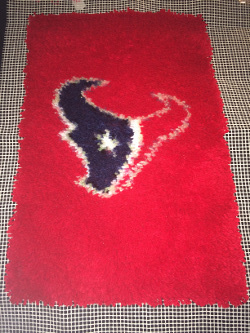 It turned out great and he loves it!" 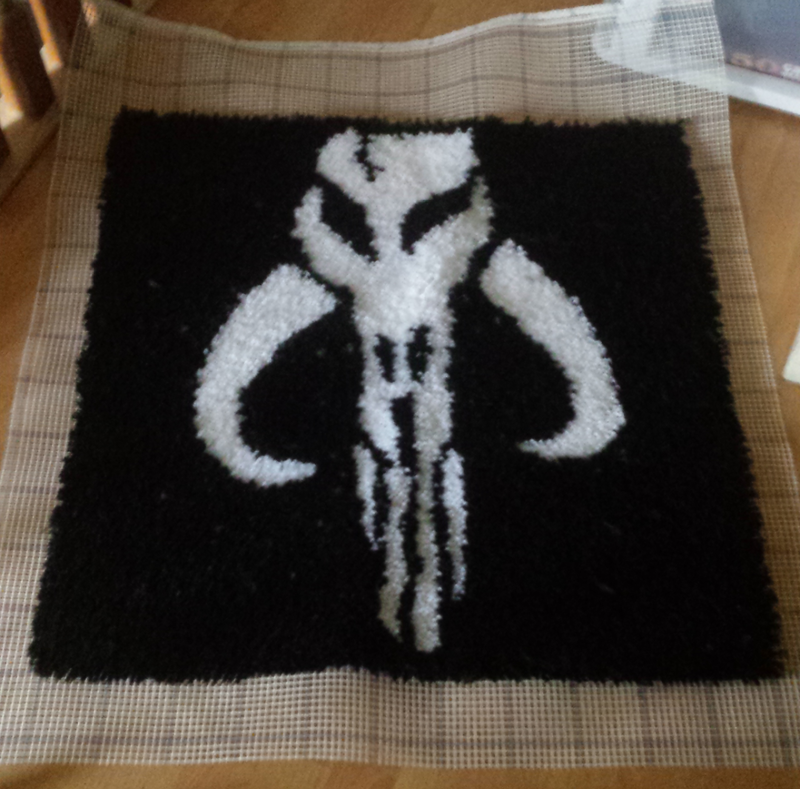 "This is a Star Wars rug I just finished. 23" x 48" My AT-AT loving daughter is thrilled. Thanks!" 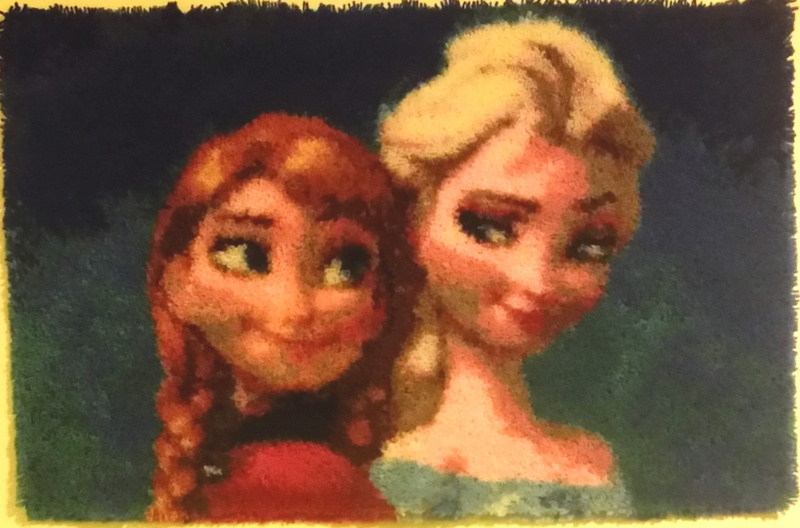 "I also made this Frozen rug for my twin daughters using your site. Thanks!" 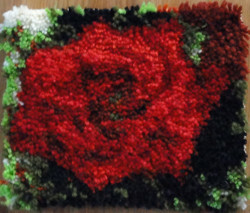 "Mickey Mouse made on a 5-mesh canvas, using Herschnerr's and Red Heart yarn. This one, by the same guy who made the Deadpool one, was done for a friend who loves Mickey. 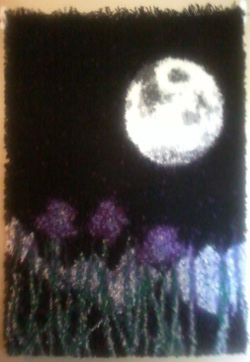 She turned it into a wall hanging." 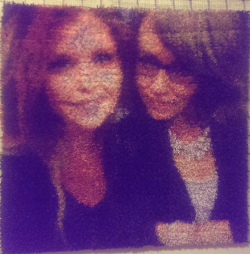 "I made this latch hook of my girls from a photo I took while we were camping. Have always loved the picture. 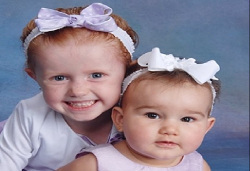 Your web-site makes it so easy to create beautiful memories!" 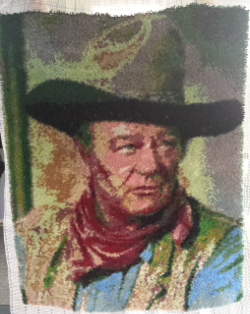 "made this as a xmas gift an wanted to say thank you so much is a great site"
"John wayne. 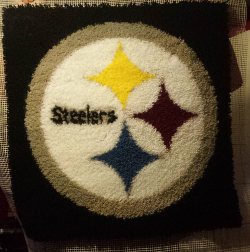 For my dad for christmas. 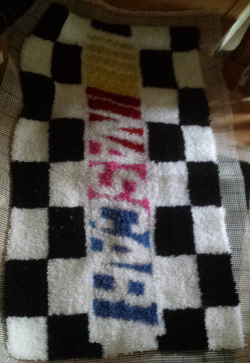 It's 3 feet by 4 feet it took me 21 days. 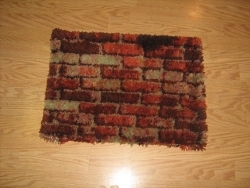 My first rug using leftsource.com." 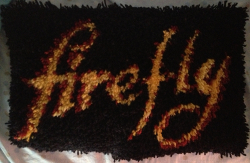 "My second rug using leftsource. A commissioned piece for a friend of the family. It is 2ft by 2ft." 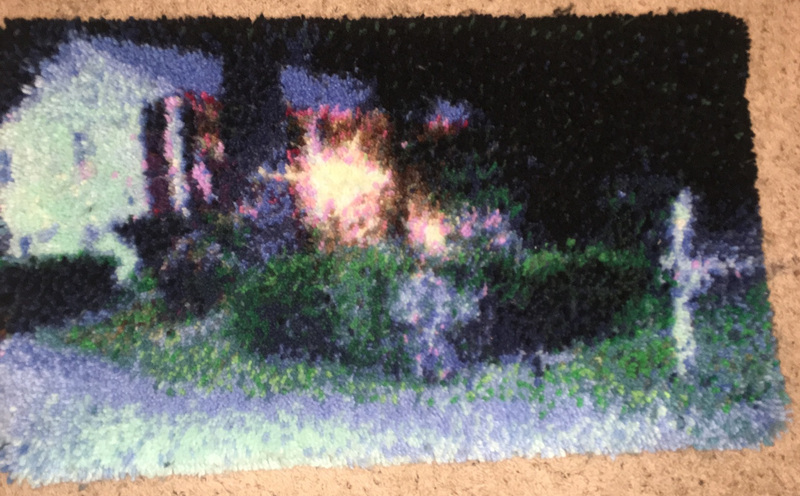 "My third rug using left source. 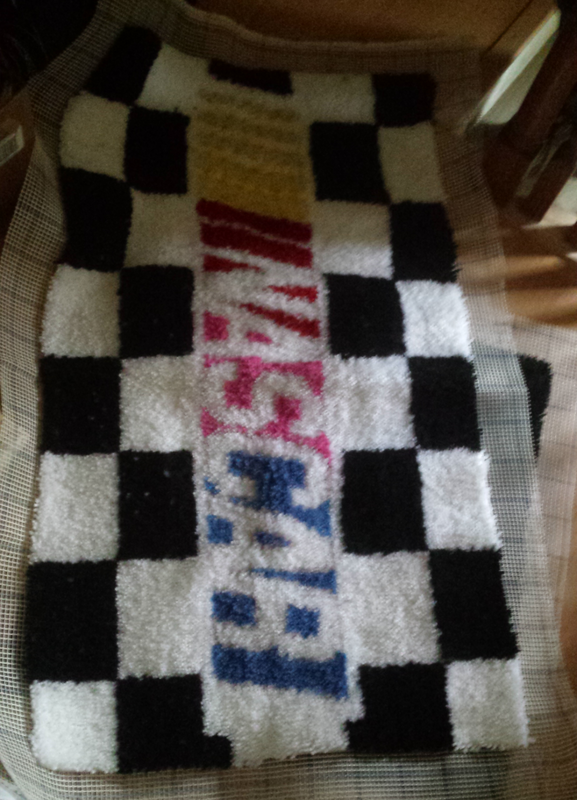 Nascar for my boyfriends parents." 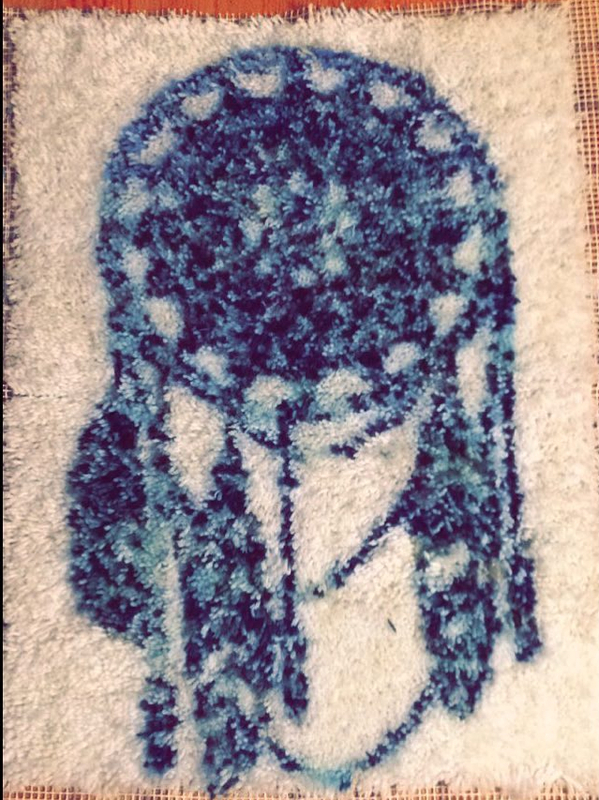 "My fourth rug using left source. 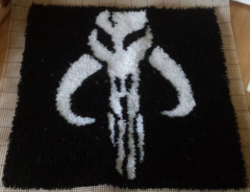 It's a mandalore for my brother. 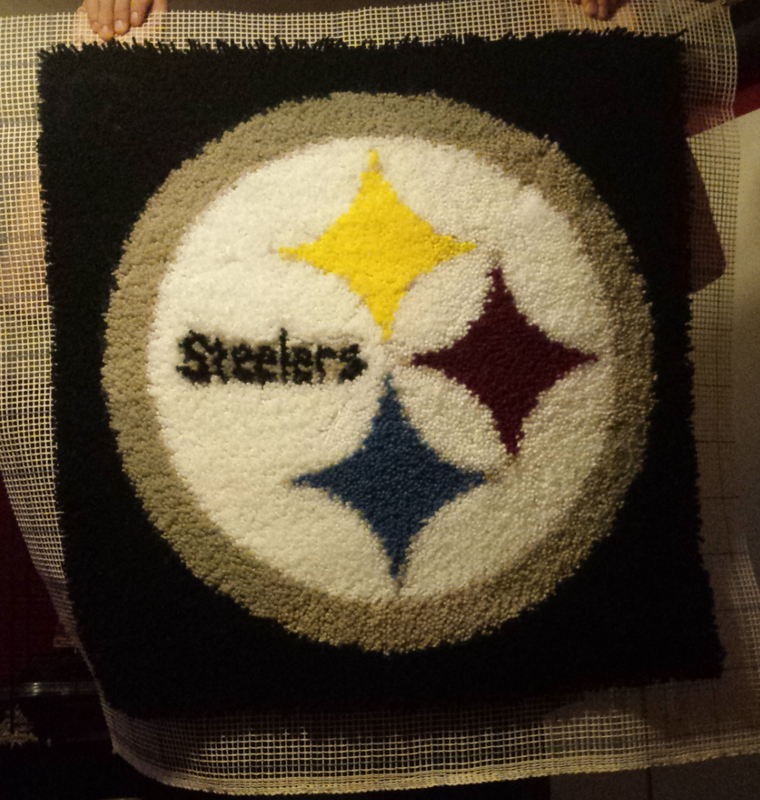 BTW I'm the same person who did the nascar, john wayne, and steelers." 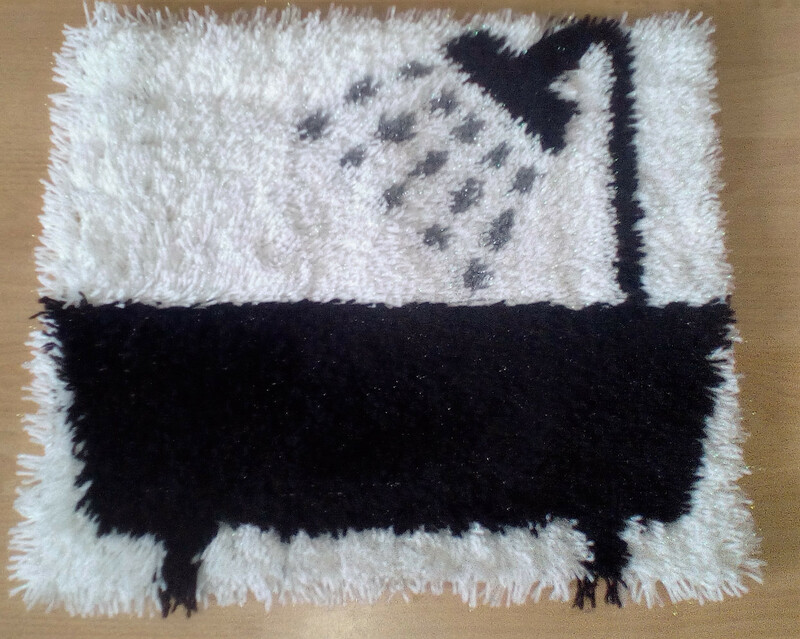 "Stumbled across your site by accident, but thought I would try creating my own rug. 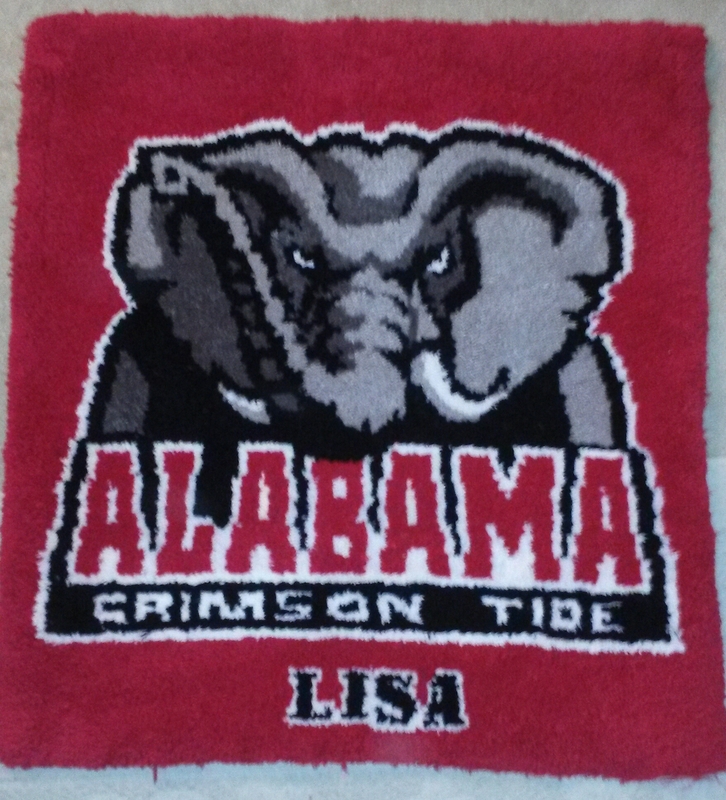 Although this is not the original size I wanted (wrong size canvas sent), I resized and created this. Dolly Parton Better Day album shot size 34 1/2" x 46", using canvas 5hpi, 47 colours. 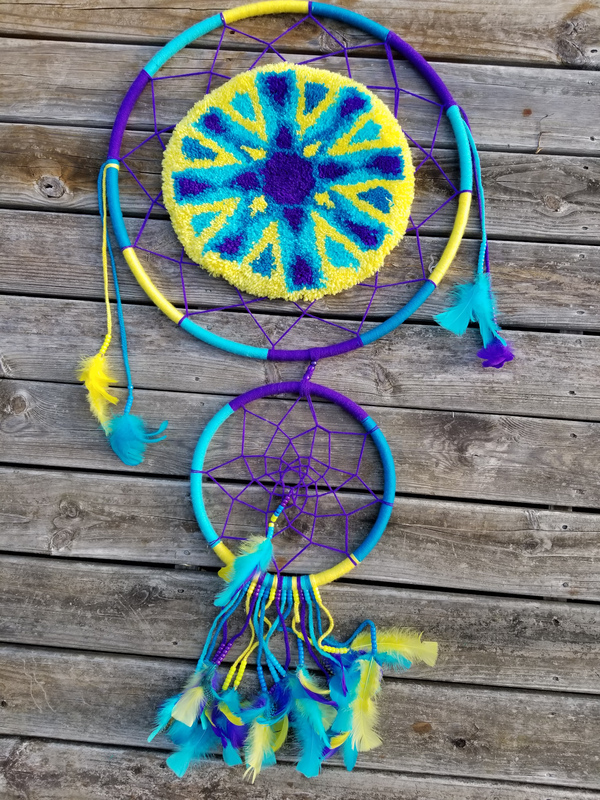 I love the finished item and will be looking to do more. Thanks Craft Critter for an awesome site." 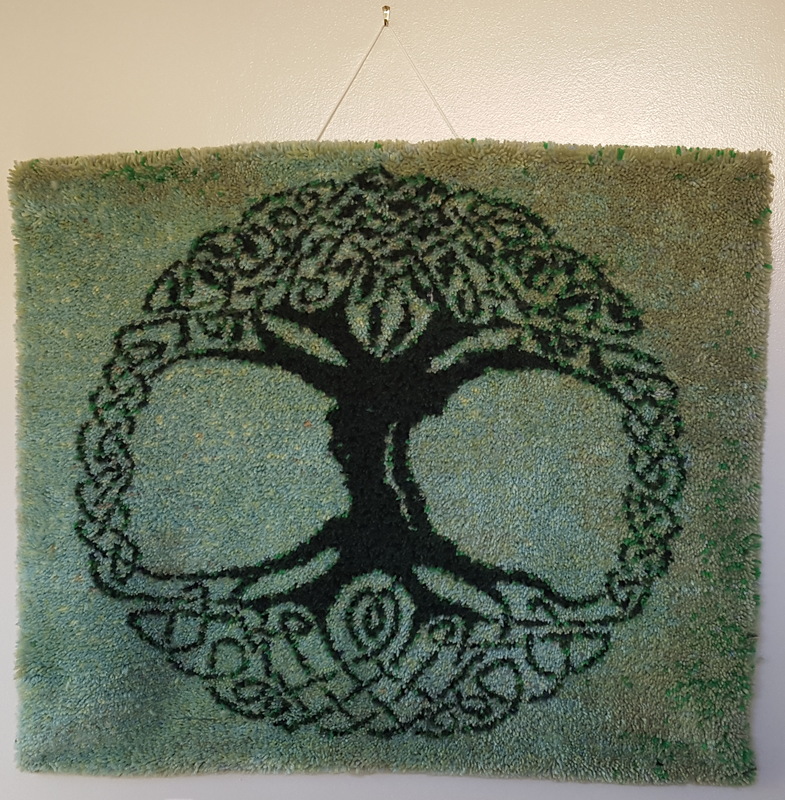 "Finished project picture, made for a friend who has invited me on his boat for a week, this is the crest on the prow of his boat." 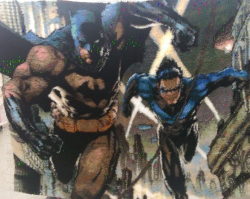 "Batman and night wing running! 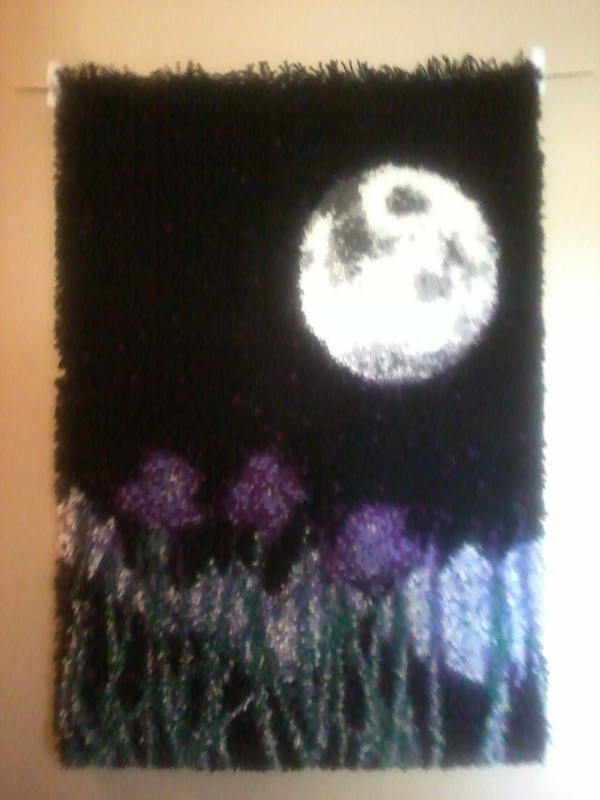 4x6 feet when I finished!" "I used your site to create a batman hook latch. 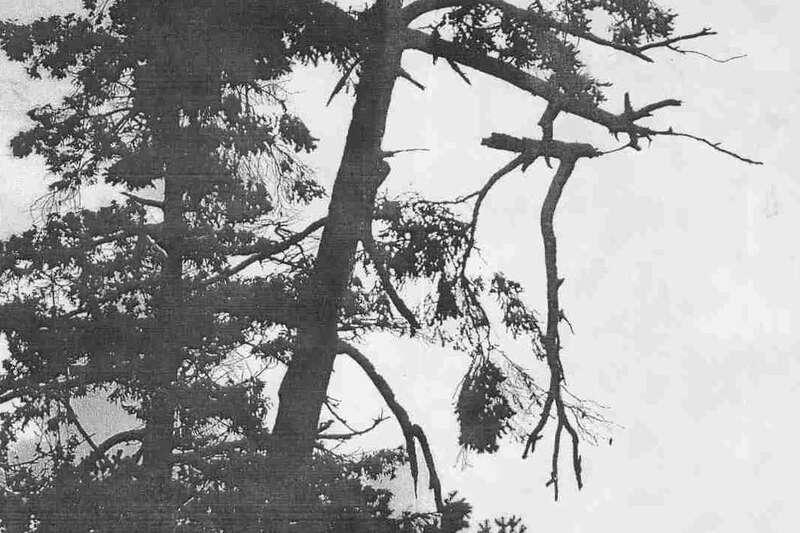 I have attached a copy of the picture for you. I think it turned out Amazing!! I have also wowed my friends and family. 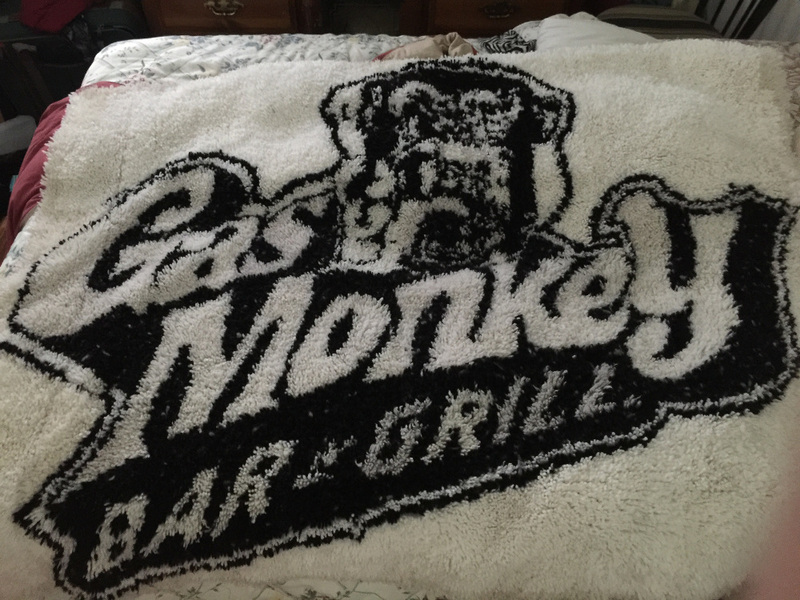 It only took me about 6 months to complete." 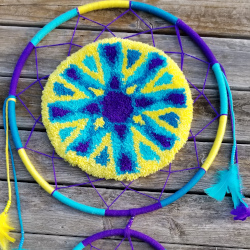 "My first project using your website and I Love it!! Thank you! :)"
"My second project! I love this website. :) Thank you. Working on my third! 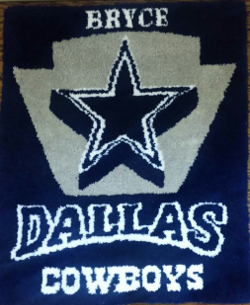 :) "
The Dallas Cowboys and the Greenbay Packers. "I made this from a picture on the internet and from using your website!" "Finished this one in a week." 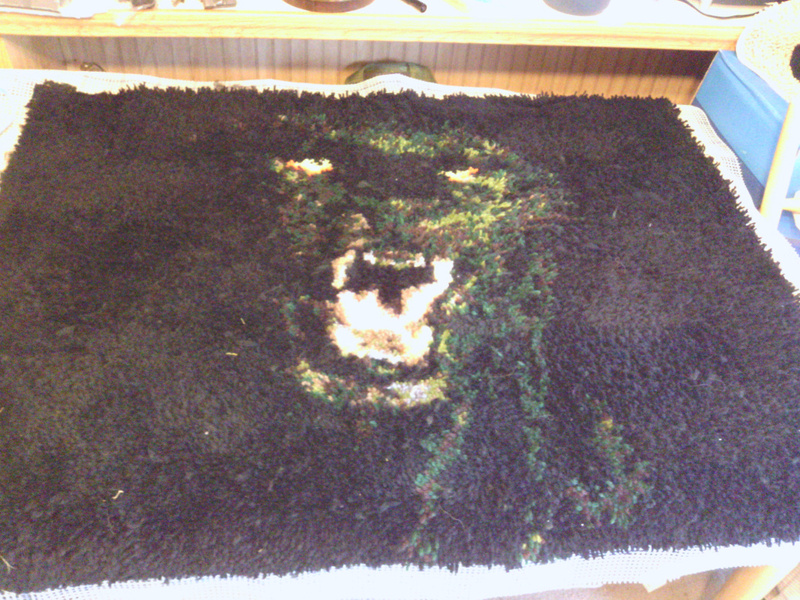 "This rug took me months to make. 3.75 yarns per inch. Around 48 colours and it was dithered. Yarn from Herchshners. Picture of my daughter left and her friend on right"
"This is a rug of my ex boyfriends dog Toby. He is 14 years old. Canvas 5 yarns per inch wide by 5 yarns per inch high. Color count 19 using Herrschners color." "Just finished another. I love leftsource! 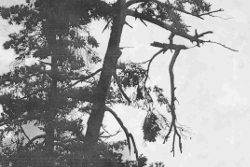 Cropped image of the picture of the hanging branch - this is the basis for the final product. From here I rendered the image down to what I wanted using a photoshop program (I use one called GIMP). First I reduced it to black and white. 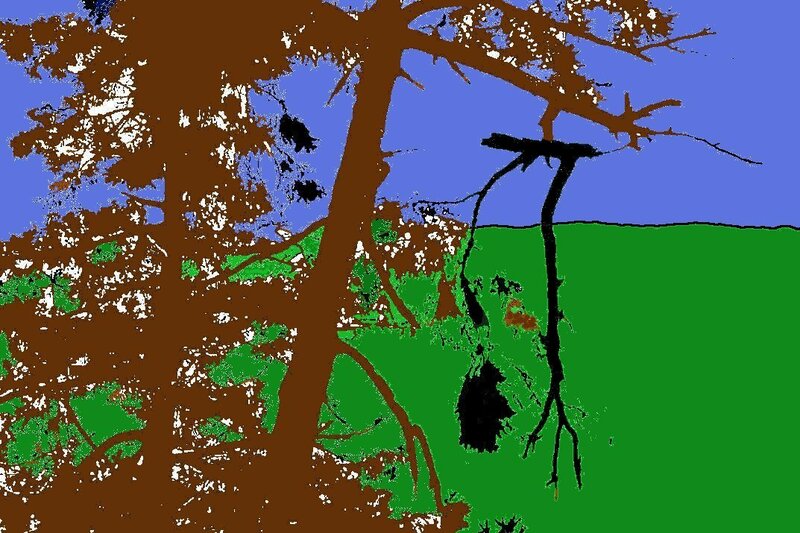 (no grayscale) Then I selected out the hanging branch in black and colored the rest of the trees brown. Then I colored in the rest of the image - this is what I fed to the leftsource website. I printed the pattern in black and white and used a 8x11 color print as a reference. I let your program do the horizontal distortion. 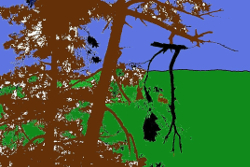 This is my very first original creation. My past experience was always working from kits. When I first envisaged this program I was kind of hoping I would find something on the Internet to help me out and found your site. 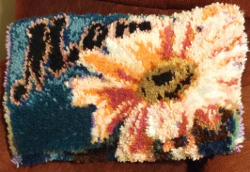 "The pillow I made for my mom." 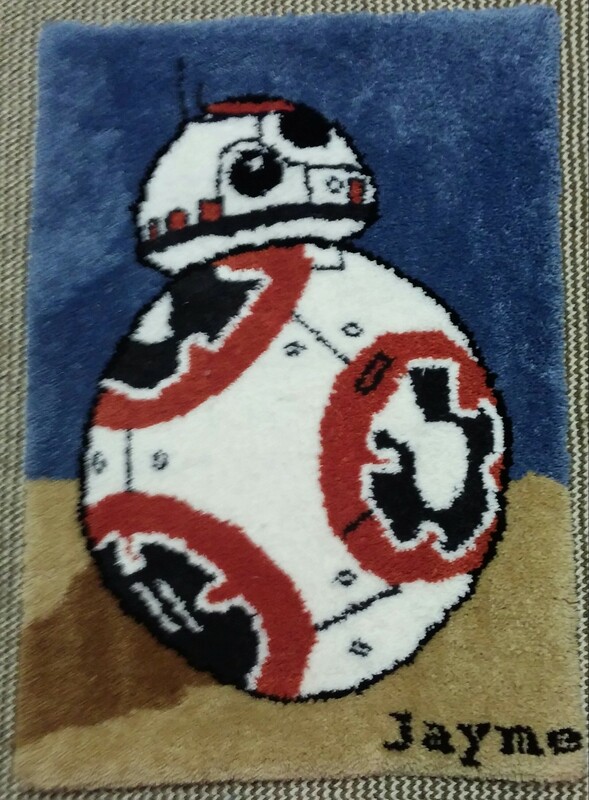 "BB-8.Done for a friend's girlfriend." 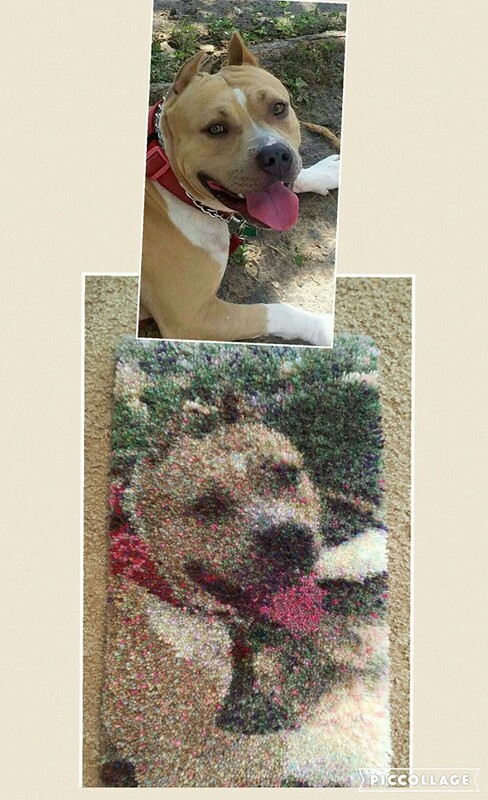 Latch hook project and original picture. 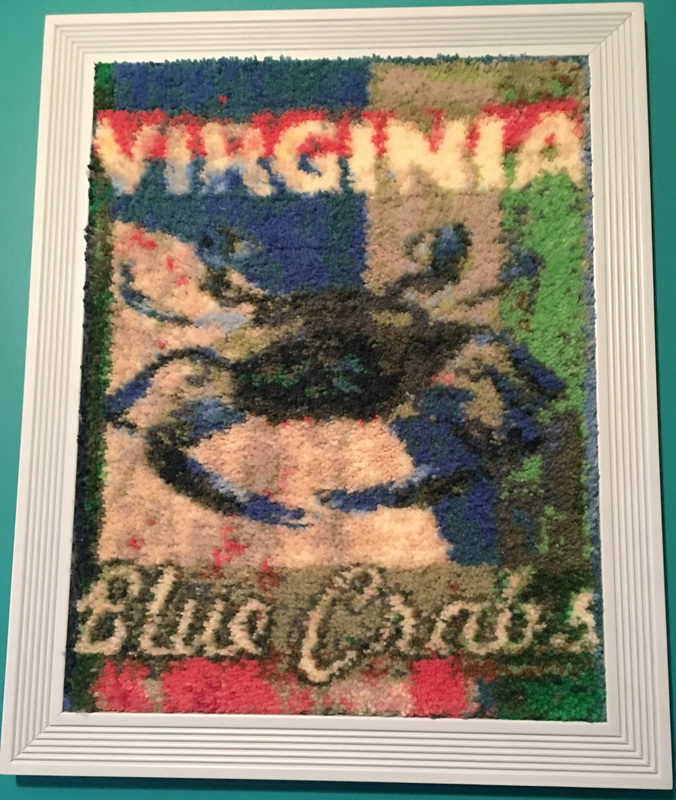 "This is my Bathroom Latch Hook Rug that I made using your website and I am very pleased with the way it turned out, Will definitely use this site again for more of my projects." 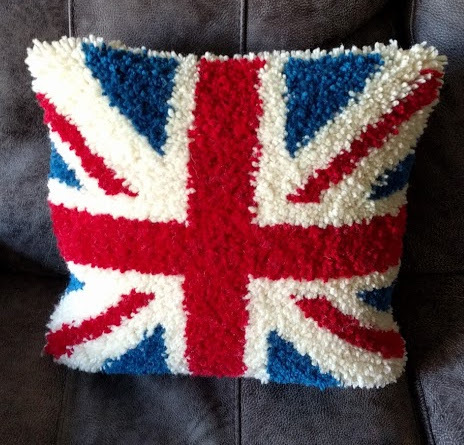 "My first pattern i did with leftsource." "A black and white portrait." "Just finished Chief Wahoo using your site, thank you." 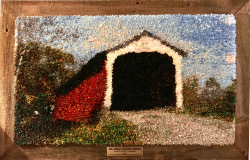 "I am not sure if I shared a picture of our daughter's latch hook she made for 4-H, but I will attach a picture. She received Reserved Grand Champion on it. We weren't able to make a custom one last year, but she has big plans for this year! Thank you for all the help you gave us on her Rose-Hulman Engineers latch hook. 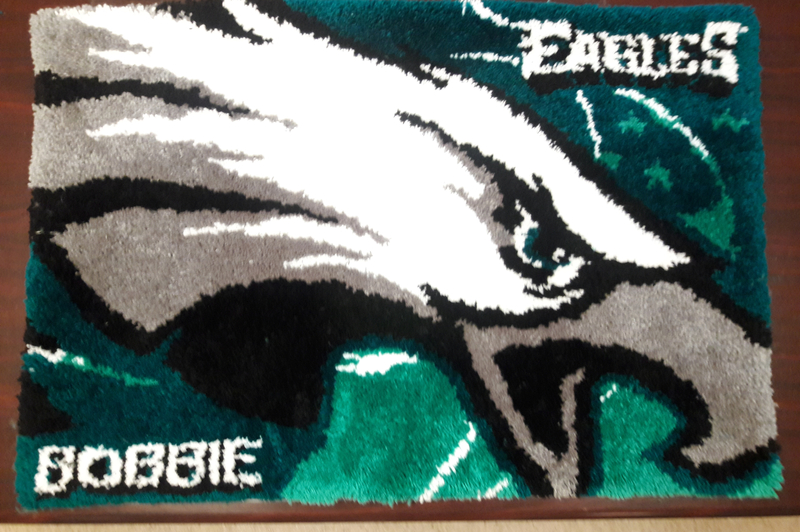 Our son is a sophmore there this year and this hangs in his room." 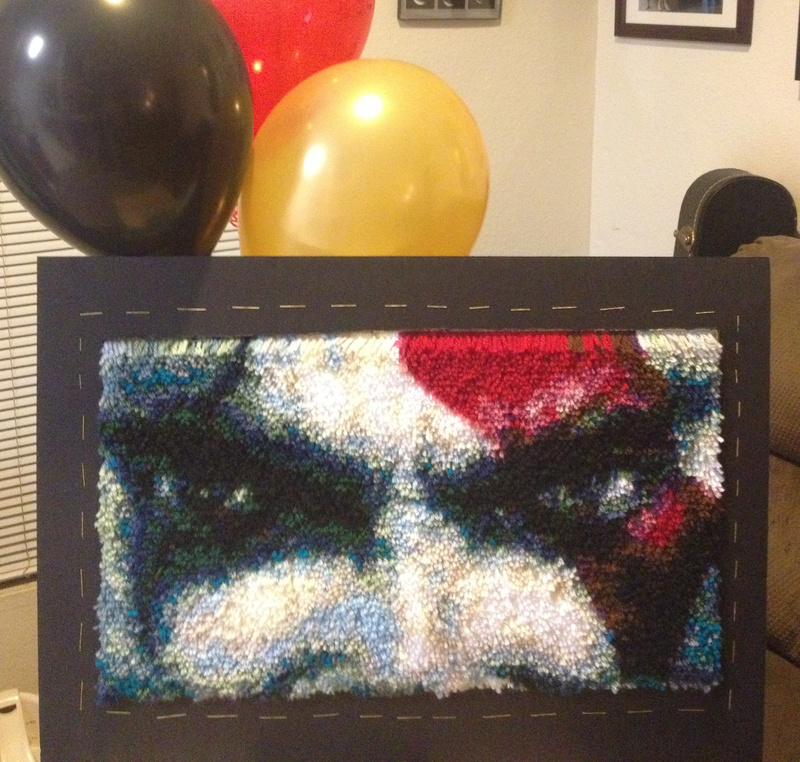 "I made this for my Son. First time using your site. Excellent." I thought you might like to see my (99%!) complete project (the final stitches of the finish backing should completed tomorrow). It was done from a pattern generated by your software back in August '16 I think it was. 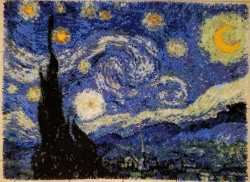 I imported/fiddled the PDF into Excel and then printed it all out, bought the wool from MCG direct and used all that on plain 4.5" hpi canvas. It's 161 rows by 216 columns so 34,776 stitches, used 19 colours and by the time it will finally be finished it will have taken me over 380 hours from first stitch to the last bit of tape binding on the back. 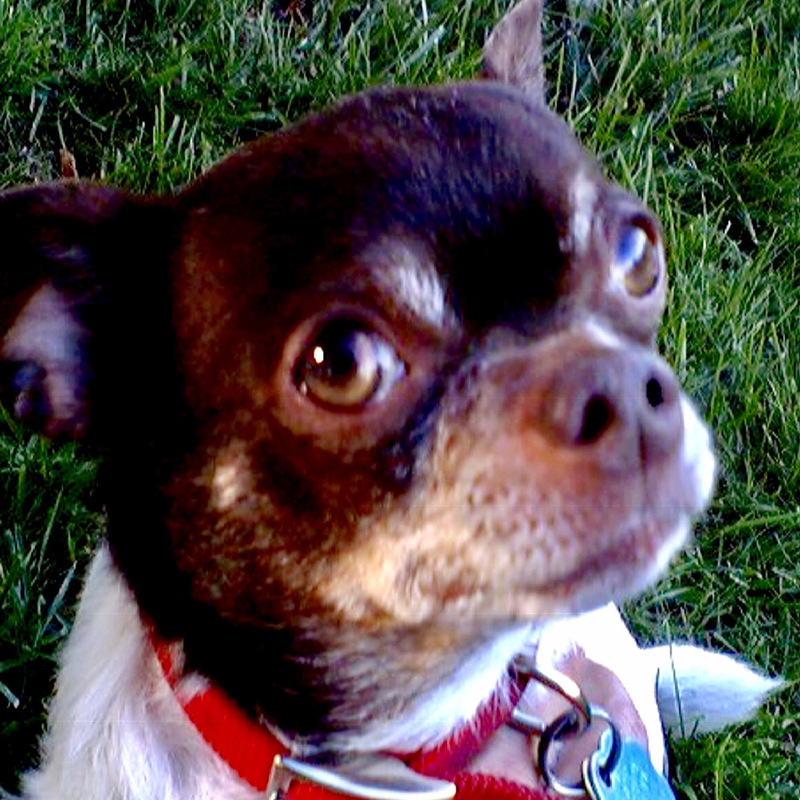 "Carlos was the best friend anyone could ask for. He lived a life of treats and affection until he passed away last January. He was 18 1/2 years old. Thanks for helping me make this tribute to my little buddy. He is back on the couch where he belongs!" 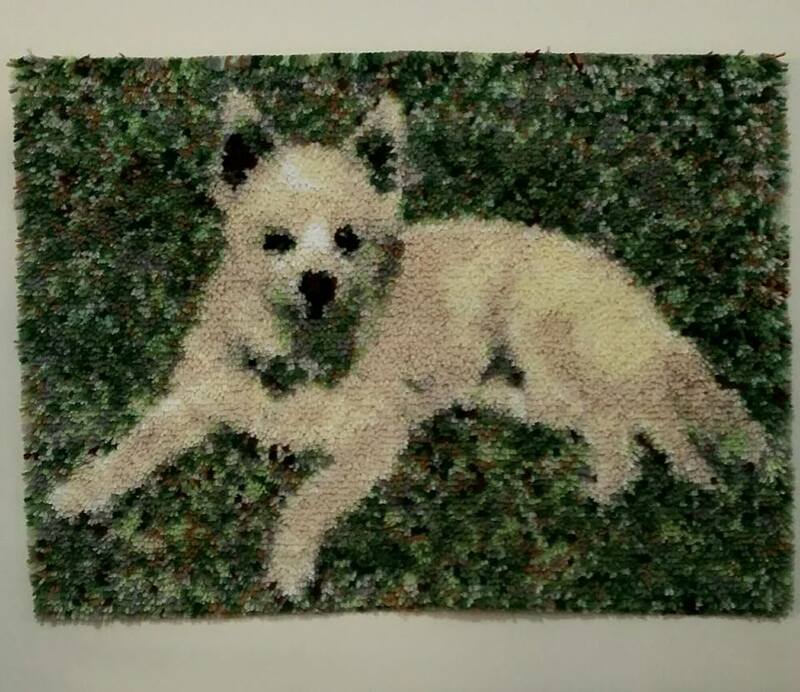 "Hi, thanks for this amazing website, I have completed my 3rd rug of 1 of my dogs. It is 30"x30" done on 5point." 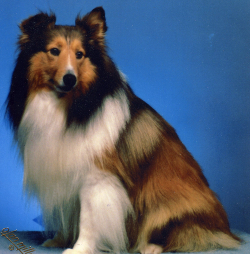 Jackson, over 14 years old. 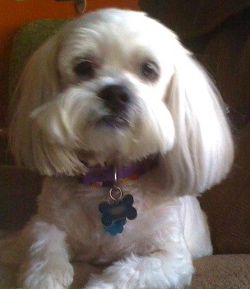 "I am thrilled with the way it turned out and the quality of your products. 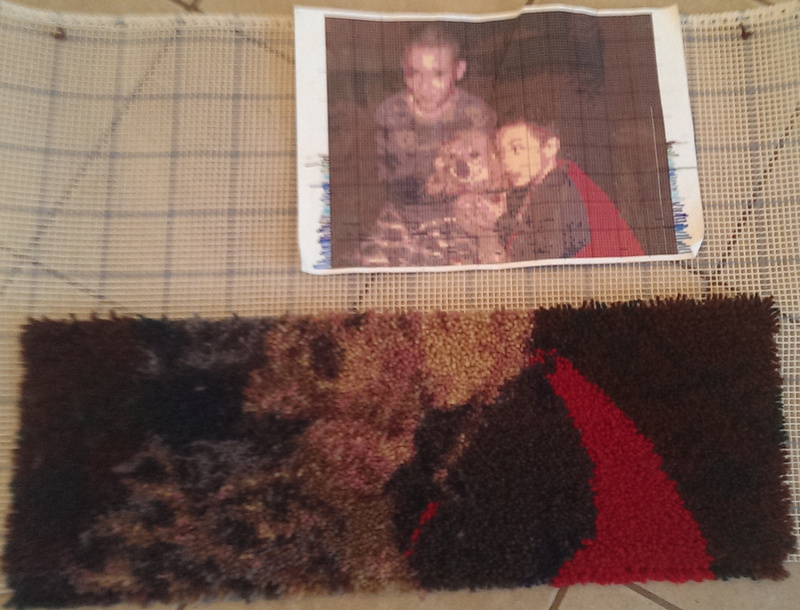 I've attached a couple photos for you to see the finished result." 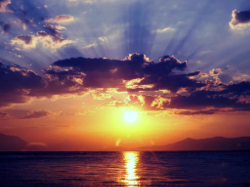 "I'm so glad with your website, because I'm enjoying and relaxing on my free time. 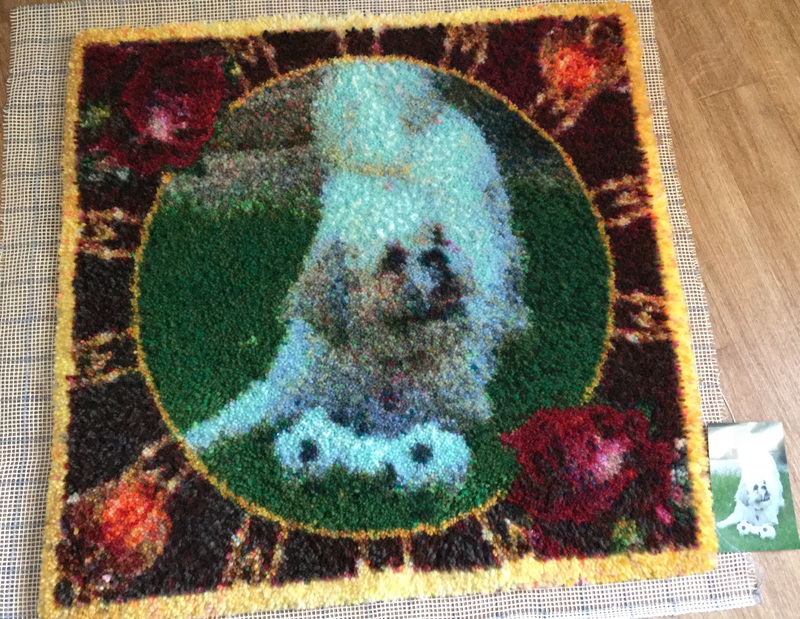 Really it's a great help to create and be busy"
"Attaching picture of dogs and finished rug. 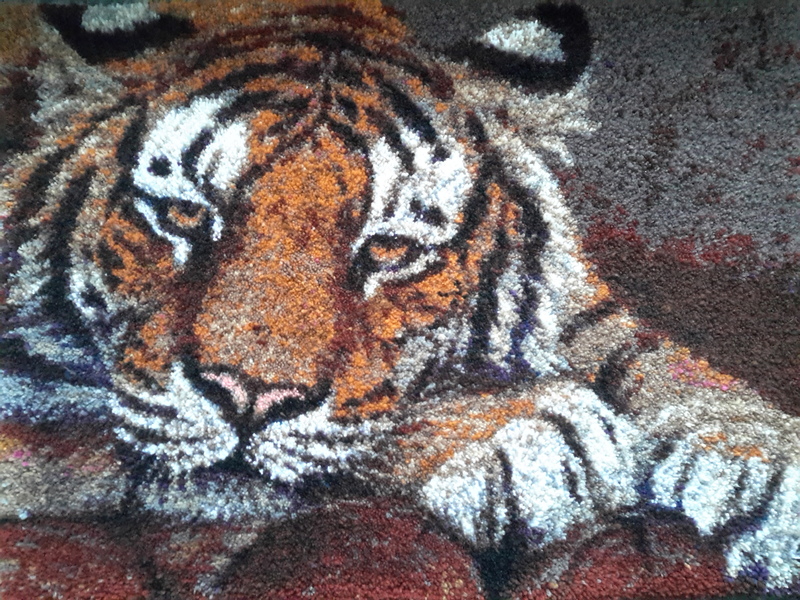 Great pattern but Mary Maxim does not have a big enough selection of colors so some of the rug is wrong color but overall very good pattern. 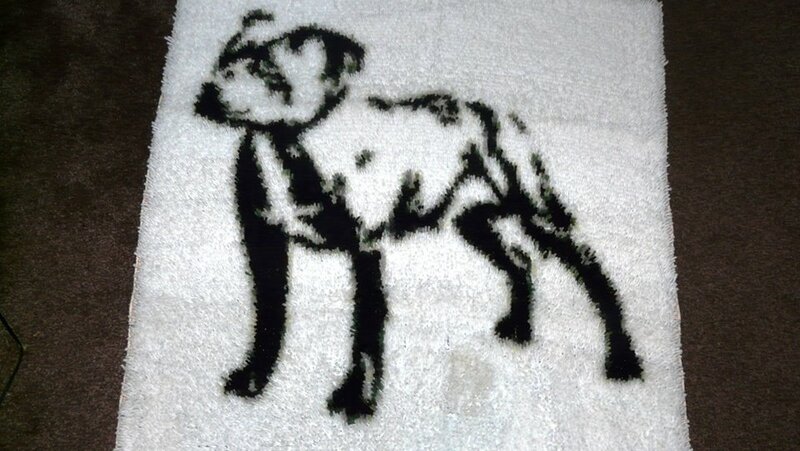 Thanks"
"Wall hanging of my dog. 36" x 26". 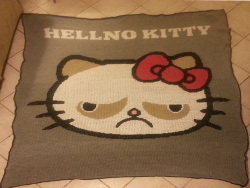 It took me 43 hours to complete with 10, 320 knots. 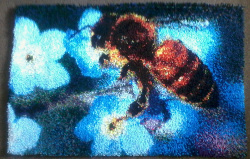 21 colors using MCG Textiles and was made on 3.3 mesh canvas. Thank you so much Left Source for your amazing programme." "Thank you for the wonderful project. 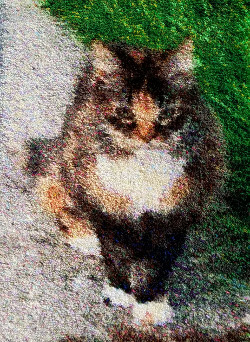 You have allowed me to memorialize my cat Taffy. The picture was taken when she was 21 years old. 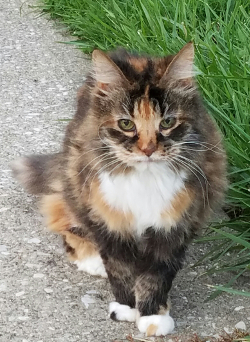 She made it to 21 years 7 months and 2 days. 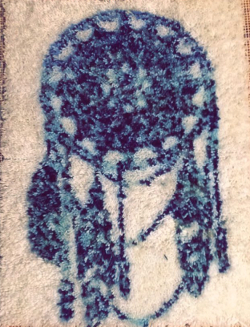 And now, she will forever be looking back at me from my rug on the wall." 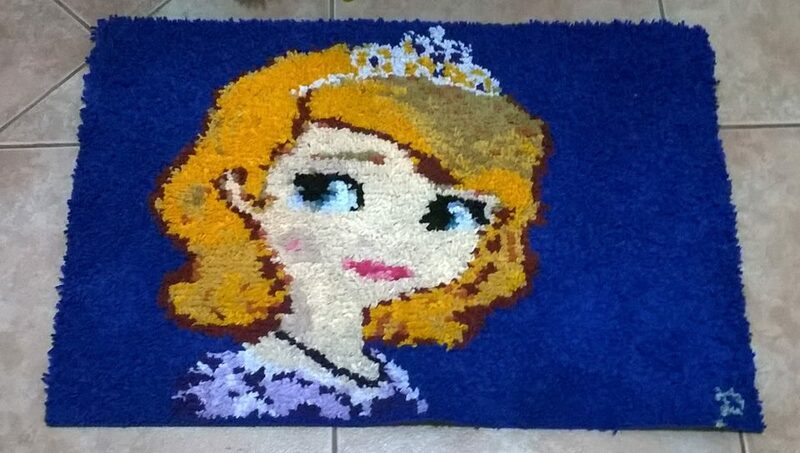 "Here is our daughter's finished project. We added the engraved plate to identify the bridge. 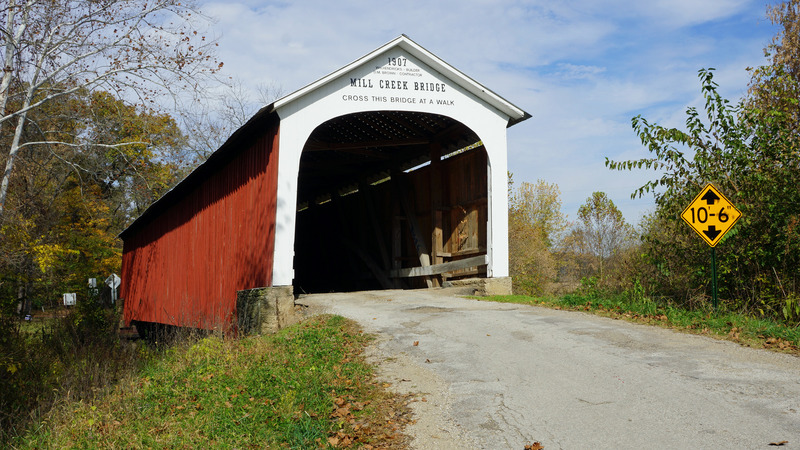 The plan is to hang it in the farm house that belongs to my family where this covered bridge is located. 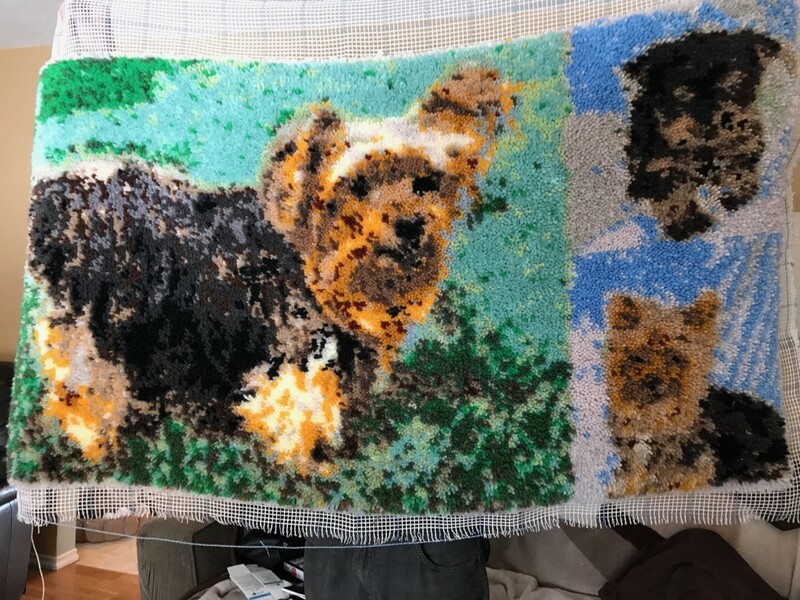 It was submitted this morning, so we will know next week how she placed... she of course believes this is grand champion material!" 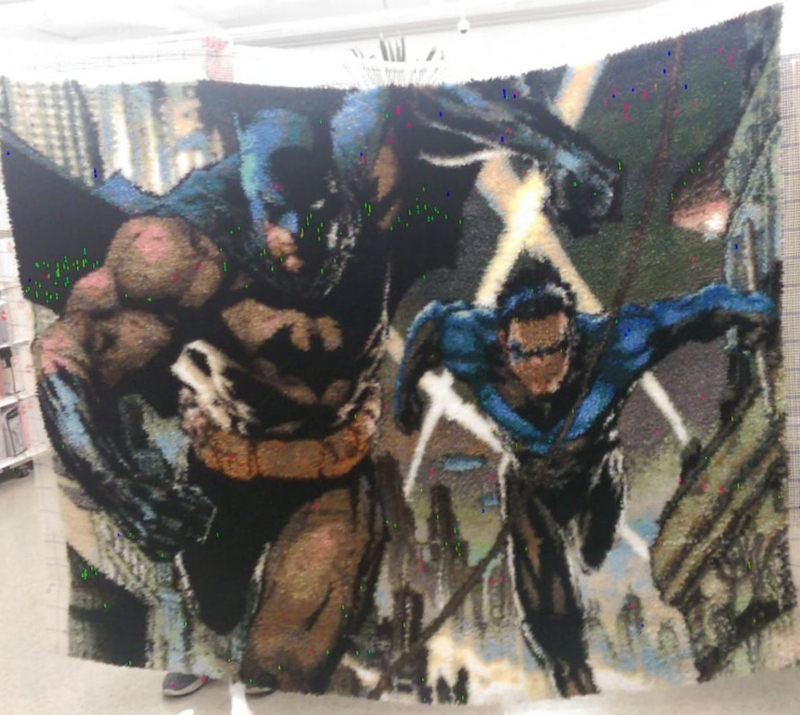 "A little over 3 months and 22,000+ pieces of yarn that I cut by hand. My Cleveland cavaliers is finished. I also did the Cleveland Indians one." 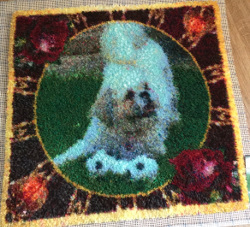 "Last rug I made her name was Abby had to put her down cancer in the bones. 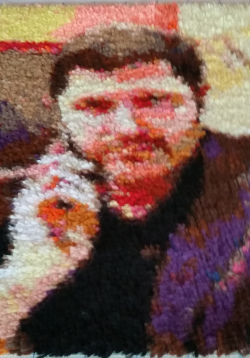 Thanks for your help making this rug possible. Turned out good." "Thank you for this site. I really enjoy making what I do." 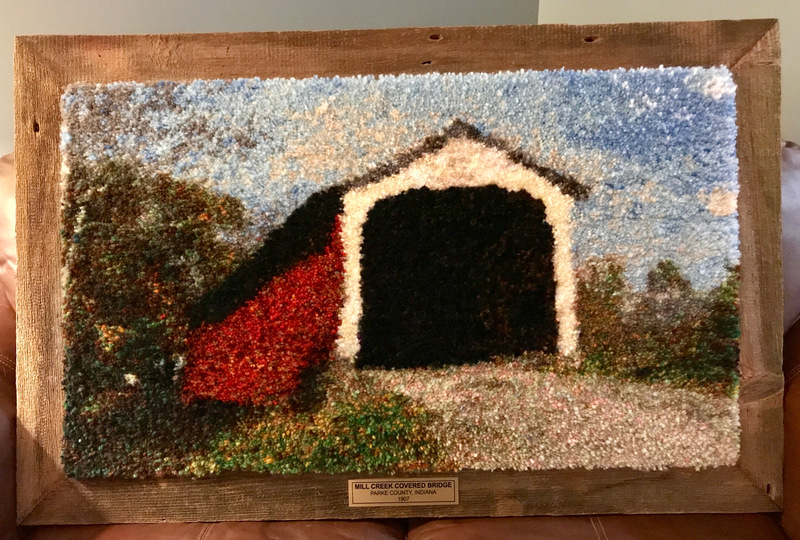 "Thank you so much for again helping me win first prize at the fair. You guys are awesome." "My project was inspired by the video game "Journey"; it took me 8 months to finish. All that's left is to find a way to hang it up; the thing's really heavy." 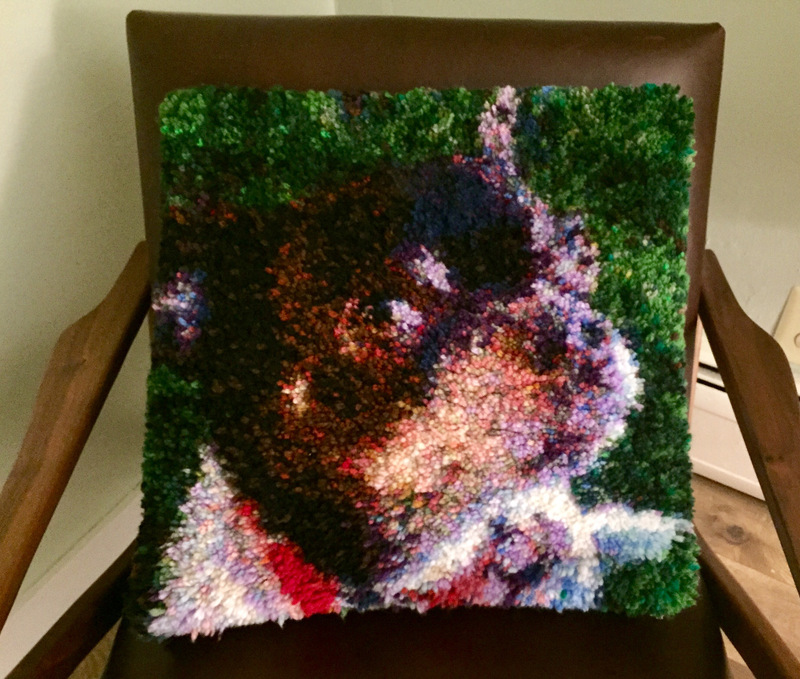 "Very happy with the finished product! Thank you! 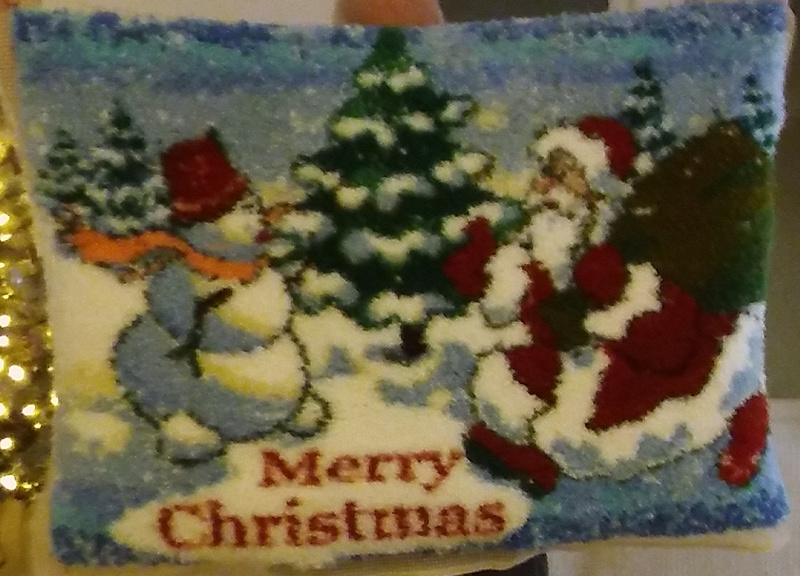 "My finished Xmas rug with pattern created on leftsource." 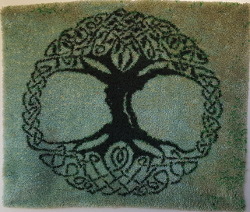 "A celtic tree of life. 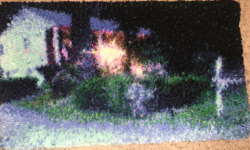 It's 48" by 43.2" and I used 19 colors with Mary Maxim." "Eagles rug came out nice. Deviated from the pattern a little but still nice." 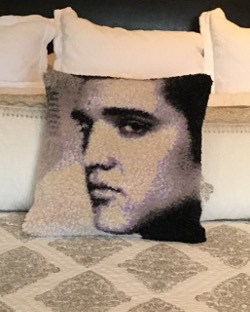 "This was the Elvis project I gave to my Sis and she had it turned into a pillow." "This is the album cover from Disturbed Believe. Husband framed it for me." 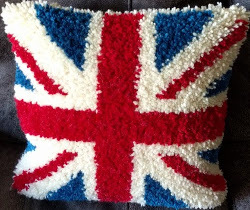 "I crochet/cross-stitch afghans with patterns I make on your site. Love it!" 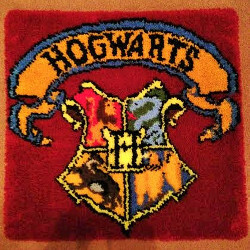 A Hogwarts Crest "for my first grandchild's nursery, which is being done in a Harry Potter theme." 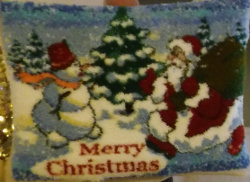 Project used Mary Maxim yarn. 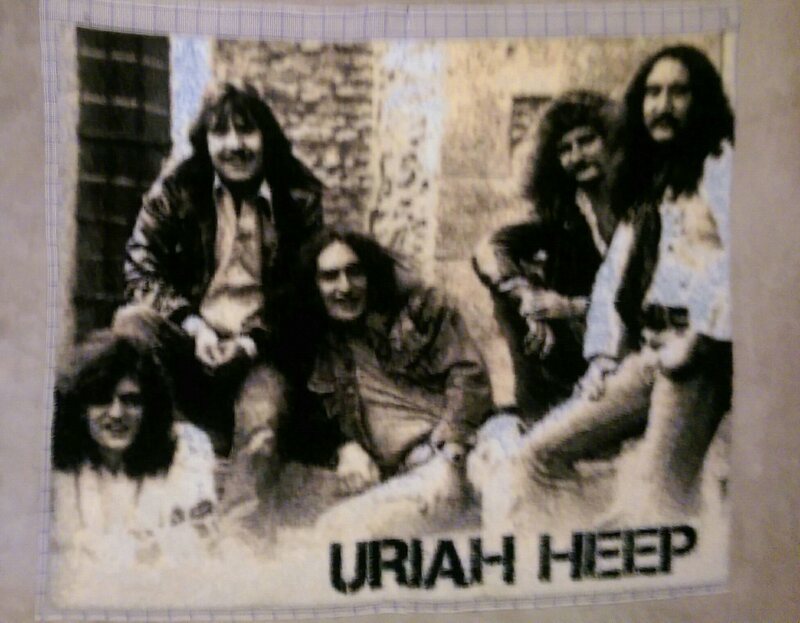 "This latch hook rug was from a Uriah Heep album cover picture. 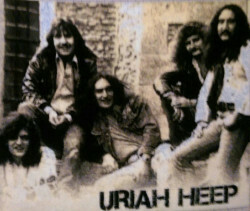 Uriah Heep was a hard rock band from the UK in the 1970s. 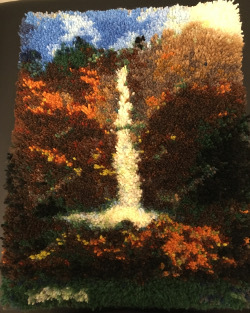 This rug was approximately 5.5 ft. x 6ft., 99,000 pieces of yarn, 72 different colors of yarn, and took me 4 years to complete. 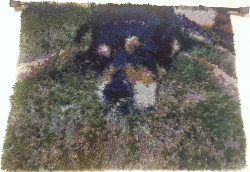 I used leftsource to turn the picture into a rug project and I am happy with the results! I used 5 mesh rug canvas for better detail. I love classic rock and would like to do another project....maybe Pink Floyd, Led Zeppelin, or Rush. Haven't decided yet. I wish MCG Textiles did not close down because they had the best latch hook yarn in a variety of colors." Starry Night. 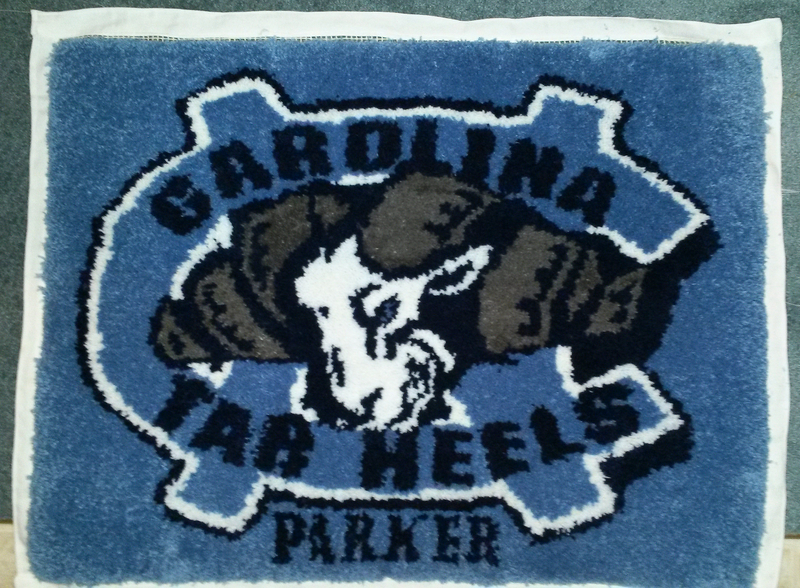 "Just finished this work of art using leftsource to create the pattern. I kept my ears, though. 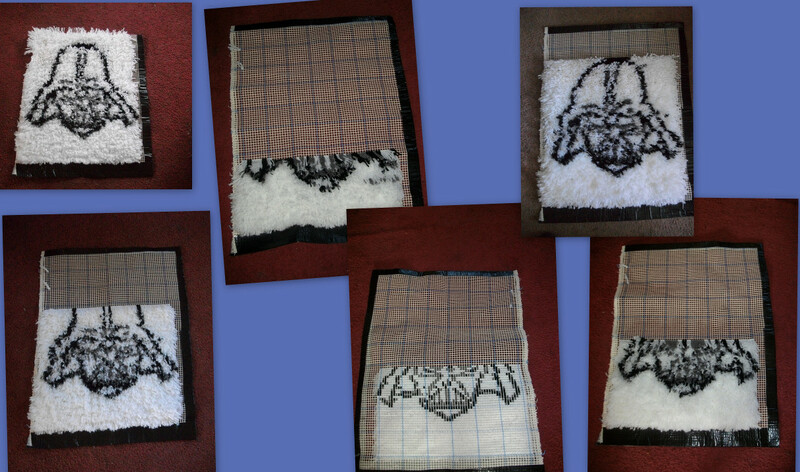 The coolest pattern I've done since the Battle of Hoth and Frozen rugs (which are also on your examples page). Appreciate your site! 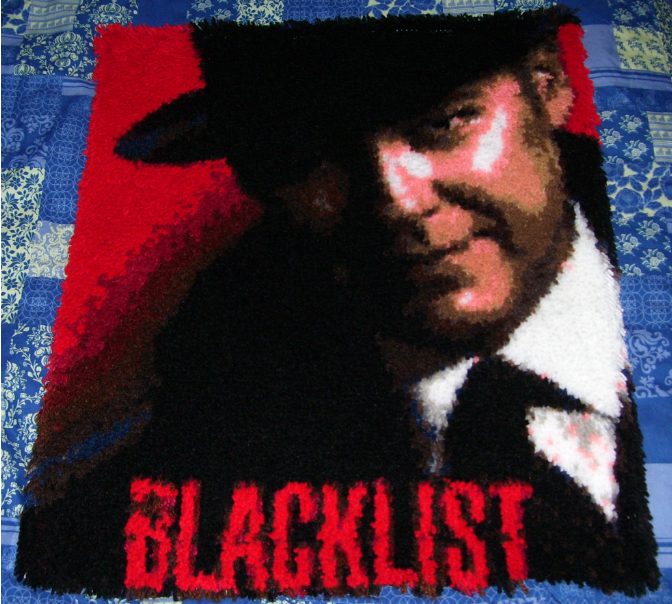 "I've just ordered my third project (all within the past month or so). 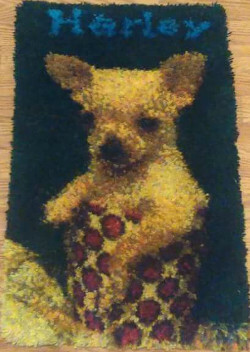 I was telling my husband that I wanted to turn my own images into latch hook rugs, and lo & behold, I found your site on the internet. I'm addicted. Only thing is, I has so much yarn left over from my first project that I hardly had to use any from my second project (except for new colors) on my second project. Now I have to find a way to use up all of my left over yarns! It' a great site with a great service! My first project is attached." 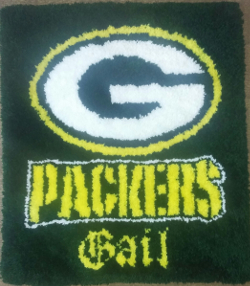 "This is my finished Green Bay Packer logo rug. 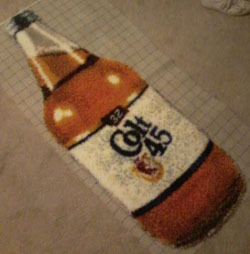 Done in 5-mesh. 36 x 27 inches." 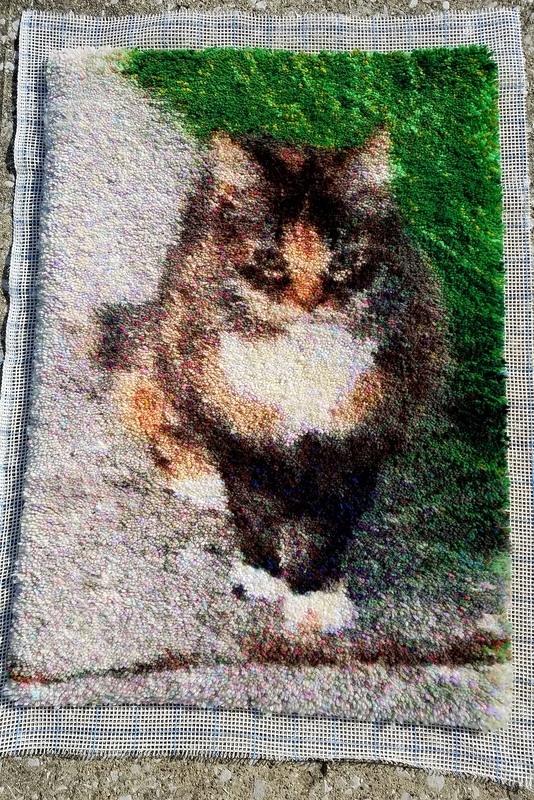 This is the result of latchhooking a gray cat in sepia tones. 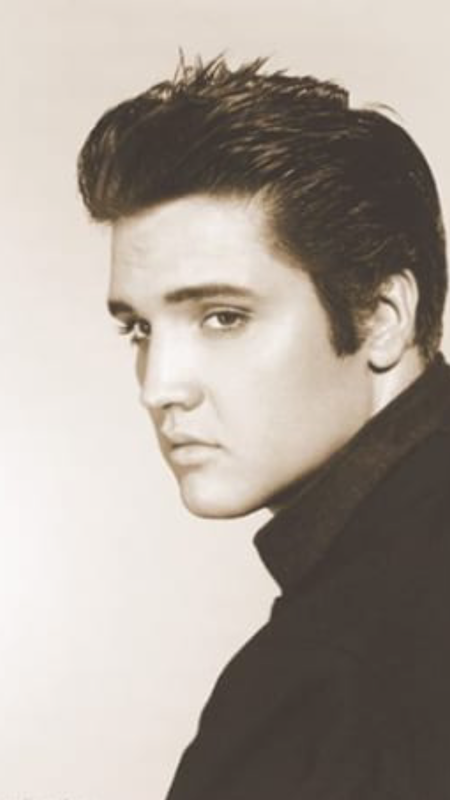 It lost a lot in the translation, so to speak, so I wouldn't advise a sepia-toned project." 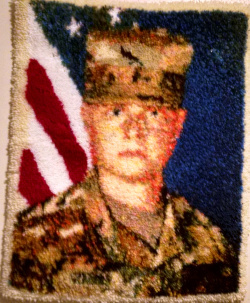 Grandson PFC Austin W. It took two months to finish.